The album was produced by Alan Tarney except tracks 3, 9 and 10 by Mags and Pål. The cover of this album is white with a blue and green landscape picture plus inset a-ha picture. It was released on LP, cassette and CD. The LP has an embossed `ink blotch' printed on the front above the picture. 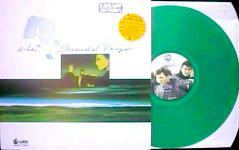 The back of the LP is white with a continuation of the landscape picture along the bottom, a small colour outdoor picture of a-ha (as on the cover of the single "I've Been Losing You") and the tracks written in blue and green. The inner sleeve has a colour picture of part of Mags and PÂl and some of the song words. On the other side are the rest of the song words and two small colour pictures of a-ha. 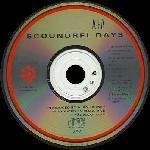 The original CD release of Scoundrel Days was "Manufactured in Germany by Record Service GmbH, Alsdorf". The front cover is more close up than that of the LP release and comes without the ink blotch. The layout of the title "a-ha Scoundrel Days" is handwritten along the top in grey. The back sleeve is in white with the full track listing printed again in grey down the left and centre parts of the upper sleeve. The barcode is displayed in the top right hand corner with the catalogue number 925 501-2 shown underneath. Some Production credits to Alan Tarney, Mags and Pal Waaktaar are also shown. The lower section of the back sleeve displays a landscape scene with an additional picture of the three band members located on the left hand side and includes the "WB Records" logo. On the lower right hand side, there is some Compact Digital Disc recording information which reads; "The music on this Compact Digital Disc was originally recorded on analog equipment. We have attempted to preserve, as closely as possible, the sound of the original recording. Because of its high resolution, however, the Compact Disc can reveal limitations of source tape". There is also some "Warner Bros Records Inc." Production and Copyright information; "Warner Bros. Records Inc., a Warner Communications Company © 1986 Warner Bros. Records Inc. for the U.S. & WEA International Inc. for the world outside of the U.S. ℗ 1986 Warner Bros. Records Inc. for the U.S. & WEA International Inc. for the world outside of the U.S. All Rights Reserved. Unauthorized duplication is a violation of applicable laws". Along the very bottom is some manufacturing text; "Manufactured in Germany by Record Service GmbH, Alsdorf – Presse en Allemagne par Record Service GmbH, Alsdorf. A Warner Communications Company". The disc itself is silver with black text and comes with a double centre ring, it displays the A-HA logo at the top with the title "SCOUNDREL DAYS" printed underneath. The track listing is shown down the left hand side with the "COMPACT disc DIGITAL AUDIO", "GEMA/BIEM" logos and LC0392 on the right hand side. The same "Warner Bros. Records Inc." Production and Copyright information which appears on the back sleeve is also included. At the lower centre of the disc, the Production Credits to Alan Tarney, Mags & Paul Waaktaar are again shown, along with the "WB Records" logo and Catalogue number. The manufacturing information; "Manufactured in Germany by Record Service GmbH, Alsdorf" is displayed around the bottom edge of the disc. The album also includes an insert which folds out into a long strip with a continuation of the landscape on one side, plus the song words and three pictures which appear on the inner LP sleeve. The second German release was instead "Made by Nimbus" and comes with the same front and back cover sleeves as the original CD pressing. The back sleeve also displays that it was; "Manufactured in Germany by Record Service GmbH, Alsdorf – Presse en Allemagne par Record Service GmbH, Alsdorf. A Warner Communications Company" and comes with the same long fold-out lyric insert. The layout of the disc is similar to the earlier pressing but comes instead with the standard clear plastic centre ring and doesn’t include the "Record Service GmbH, Alsdorf" text printed around the bottom edge of the disc. On the right hand side, underneath the usual "Warner Bros. Records Inc." Production and Copyright text, it additionally includes the wording "Made by Nimbus". The catalogue number 925 501-2 and matrix coding 925501-2 @ 1 around the centre ring of the disc is exactly the same. There is another "Nimbus" manufactured CD edition of Scoundrel Days which was pressed in England and comes with the same regular German "Record Service GmbH, Alsdorf" front and back cover sleeve. The layout of the disc is also very similar to the original German made release which again comes with a double centre ring, but it now includes the additional text; "Made in England by NIMBUS" shown on the right hand side underneath the "Warner Bros. Records Inc." Production and Copyright Information. Unlike the German "Nimbus" edition, the UK made edition additionally includes the text; "Manufactured in Germany by Record Service GmbH, Alsdorf" around the bottom edge of the disc. The catalogue number 925 501-2 and matrix coding 925501-2 @ 1 on the disc is the same as that on the German "Nimbus" release. The first UK/European CD release of the album was again "Manufactured in Germany by Record Service GmbH, Alsdorf" and includes the same regular front/back cover artworks and long fold-out lyric insert. On the back sleeve underneath the barcode (and on the actual spine itself), the full European catalogue number 7599-25501-2 is now displayed. The French catalogue number FRANCE WE851 is also included on the back sleeve. The CD itself is exactly the same as the original German made CD and displays the shortened catalogue number 925 501-2 and "Record Service GmbH, Alsdorf" manufacturing information. The matrix number around the centre ring has also been changed to 759925501-2 RSA. There was a re-issue of the European CD album which comes instead with another different catalogue number 7599-25733-2 WE 835, the French part now being WE 835 rather than the usual WE 851. The front and back cover sleeves are otherwise the same as the UK/European earlier pressing, but the usual "German Record Service GmbH, Alsdorf" manufacturing information at the bottom of the disc has been replaced with"Made in Germany". The full European catalogue number 7599-25501-2 has also now been printed onto the disc. There are at least three different issues of this second pressing, all look the same but come with a different matrix number; 759925501-2 RSA, 759925501-2.2 07/99 and 759925501-2.3 V01 RZC engraved around the centre ring of the disc. Some copies also come with a yellow round exclamation sticker stuck onto the front of the CD case. The cover of the UK cassette features the a-ha shot plus ink blotches on a white background but does not include the landscape picture. It is printed in a landscape fashion, the title "a-ha Scoundrel Days" is displayed pencil written above. The cover folds out with the song words plus the small colour picture as on the reverse of the LP / CD. The spine of the insert is white with grey text plus part of a blue ink blotch. 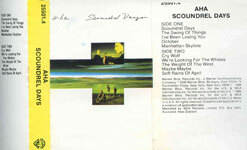 The title "A-HA SCOUNDREL DAYS" is again printed landscape on the left hand side, with the "WB Records" logo and catalogue numbers for the UK:WX 62C, Germany 925 501-4 (X) and FRANCE WE 491 at the bottom displayed vertically. The back sleeve comes with the track listing for side 1 displayed down the left hand side and side 2 down the right hand side, a black barcode is included in-between. There is some manufacturing information shown at the bottom; "A WARNER COMMUNICATIONS COMPANY. 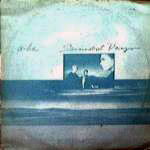 MANUFACTURED IN THE UK" with the usual Production text to; "Alan Tarney, Mags and Pal Waaktaar". There is a "LC 0392" symbol at the bottom right hand corner. On the inside of the black sleeve, it includes the "WB Records" logo at the top with the text; "Also Available on Compact Disc". There is some Copyright and Production information to "Warner Bros. Records Inc." which reads; "© 1986 Warner Bros. Records Inc. for the U.S. & WEA International Inc. for the world outside of the U.S. (P) 1986 Warner Bros. Records Inc. for the U.S. & WEA International Inc. for the world outside of the U.S.". The "Warner Bros. Records Inc. 3300 Warner Blvd., Burbank, Calif. 91510 a Warner Communications Company ®" contact address is also shown. At the bottom, there is some publishing text; "All titles published by (G. B. only) ATV Music". and the usual copyright information; "All rights reserved. Unauthorized duplication is a violation of applicable laws". 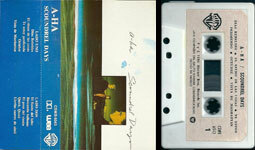 The cassette is white with blue titles, the "A-HA" logo, "SCOUNDREL DAYS" and "SEE INLAY CARD FOR DETAILS" is shown at the top of each side with some Copyright and Distributing information at the bottom; "All rights of the manufacturer and of the owner of the recorded work reserved. Unauthorised public performance, broadcasting and copying of this tape prohibited. Distributed by WEA Records Limited. A Warner Communications Company". Additionally on the left hand side of each side, separated by a vertical double line is the "WB Records" logo, UK only Catalogue number WX62C, "DOLBY SYSTEM" logo and "(P) 1986 A WEA RECORDING". There is a German made cassette of "Scoundrel Days" which was "Manufactured in Germany by Record Service GmbH Alsdorf" and was used mainly for the European market in the UK, Germany and France; it comes with the exact same front and back cover lyric insert as the UK edition, but the manufacturing information on the back sleeve is different, it reads; "Manufactured in Germany by Record Service GmbH, Alsdorf. Fabrique en Allemagne par Record Service GmbH, Alsdorf. A Warner Communications Company". The tape itself is black with grey printed text and differs compared to the UK edition, it comes with a different layout and font size. The title "A-HA SCOUNDREL DAYS" is displayed at the top with the track listing to each side underneath. On the left hand side, the "WB" logo, catalogue number 925 501-4 WX62C and "GEMA/BIEM" logo is shown, whilst on the right hand side, it displays side 1/2, "120us" and the "DOLBY SYSTEM HX-pro B-NR" logo. Along the bottom of side 1, there is some copyright information; "All rights of the producer and of the owner of the work reproduced reserved. Unauthorised copying, hiring, public performance and broadcasting of this recording prohibited". Along the bottom of side 2, it instead displays some Production text; "Produced by Alan Tarney . *Produced by Mags and Pal Waaktaar. ℗ + © 1986 Warner Bros. Records Inc. for the U.S. & WEA International Inc. for the world outside of the U.S.". There is another German made pressing which comes with the exact same folded insert as the earlier release and was again "Manufactured in Germany by Record Service GmbH Alsdorf". The tape is transparent clear with a grey centre piece and white printed text. At the top, the layout and font size of the title and track listing to each side is smaller compared to the earlier German made release, The title "A-HA/SCOUNDREL DAYS" is also only printed on one line. On the left hand side, the "WB Records" logo is shown slightly larger compared to the earlier pressing, plus the catalogue number 925 501-4 WX62C and "GEMA/BIEM" logo are again included. On the right hand side; it includes side 1/2, 120μs and the "DOLBY SYSTEM HX-pro B-NR" logo. Along the bottom of side 1, the regular copyright information is again being displayed with the production text being shown along the bottom of side 2. Tracks: Scoundrel Days (3:56) / The Swing Of Things (4:14) / I've Been Losing You (4:24) / October (3:48) / Manhattan Skyline (4:52) // Cry Wolf (4:05) / We're Looking For The Whales (3:39) / The Weight Of The Wind (3:57) / Maybe Maybe (2:34) / The Soft Rains Of April (3:12). The LP comes instead with the title printed in Spanish "Dias de Travesura" handwritten onto the front of the sleeve and includes a black "wea" logo in the top right hand corner. The track listing is displayed in Spanish on the back sleeve and printed in light green for side one and dark green for side two. At the top right hand corner, there is no barcode included, but is replaced instead with the Catalogue number 80031 which differs compared to the European and USA releases. Along the bottom centre of the back sleeve is some Spanish Record Company; "wea discos s.r.l. Una Compania del Grupo Warner Communications" and Copyright Information; "Prohibida la reproduccion, locacion y prestamo de este ejemplar y su radiodifusion o ejecucion publica. Reservados todos los derechos de los autores de las obras y del productor de fonogramas". Some other Spanish Production text "℗ 1986 Warner Bros. Records Inc. para los Estados Unidos & WEA International Inc. para el resto del mundo" is also shown under the regular album artwork pictures, along with the Manufacturing and distributing information which is printed and located landscaped in the bottom right hand corner; "Fabricado y Distribuido por EMI ODEON S.A.I.C.". The record itself comes with white printed labels displaying the title "DIAS DE TRAVESURA" and full track listing in Spanish & English. There is some other Spanish Production text; "A-HA (Interprete) Prod. por Alan Tarney / * Prod. 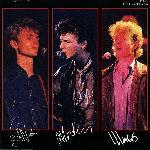 por Mags & P. Waaktaar" and "℗ 1986 Warner Bros Records Inc. para los EE.UU & WEA Int. para el resto del mundo" included above and below the track listing. The regular large colour "WB RECORDS" logo is included near the top, with the Manufacturing and distributing information similar to that on the back sleeve shown above; "PUBLICADO POR wea discos s.r.l. FABRICADO Y DISTRIBUIDO POR EMI-ODEON SAIC San Martin 3590 – Florida (Pcia. de Bs. As.)". Additionally printed around the outer rim of the label is; "MARCA REGISTRADA SADAIC-BIEM and INDUSTRIA ARGENTINA AADI-CAPIF", along with some Spanish Copyright text; "RESERVADOS DERECHOS DE LOS AUTORES, INTERPRETES Y PRODUCTORIES FONOGRAFICOS SOBRE OBRAS GRABADAS EN ESTE DISCO. PROHIBIDA SU REPRODUCCION PUBLICA O PRIVADA, ALQUILER, CANJE O EJECUCION PUBLICA." which reads the same on both sides. The Catalogue number 80031 is displayed at the bottom. The inside of the LP comes additionally with the inner sleeve displaying the regular artwork pictures and full track lyrics, it again has the track titles printed in Spanish and displays the Argentine Catalogue number 80031. The Argentine CD album comes with the regular title "SCOUNDREL DAYS" on the front sleeve unlike the LP and Cassette releases which use the Spanish translation "DIAS DE TRAVESURA". The CD is also very similar to the European reissue, and comes with the same Catalogue number 7599-25501-2 WE 835 printed on the back sleeve. The front cover displays the usual album artworks with the grey handwriting title along the top and picture of the three band members with the landscape scene behind underneath. There is also a silver "FLAP F" hologram sticker included on the front of the CD case. The inside of the CD comes with the same European long fold-out lyric booklet displaying a continuation of the landscape scene artworks throughout. At the bottom of the back sleeve, the Manufacturing and Copyright information is different and has been printed instead in Spanish to read; "Warner Bros. Records Inc., a Warner Communications Company © 1986 Warner Bros. Records Inc. for the US & WEA International Inc. for the world outside the US. ℗ 1986 Warner Bros. Records Inc. for the US & WEA International Inc. for the world outside the US. Publicado y distribuido por Warner Music Argentina S.A. Miembro de CAPIF. Reservados todos los derechos del productor, de los autores y de los interpretes de las obras reproducidas en este ejemplar, prohibida la reproduccion, regrabacion, alquiler, prestamo, canje, ejecucion publica, radiodifusion y cualquier uso no autorizado de estos fonogramas. SADAIC – BIEM/AADI – CAPIF. INDUSTRIA ARGENTINA. Si tiene alguna denuncia sobre pirateria llame gratis al 0-800-333-4275". The usual "WB" logo and white barcode "0 7599-25501-2" are the same. The disc itself is again silver with black text, the layout and design is very similar to the European release including the English title "A-HA SCOUNDREL DAYS" printed at the top, but doesn’t include the wording "Made in Germany" on the lower left hand side or the Production and Copyright text on the lower right. Around the outer edge of the disc is instead some additional Spanish Manufacturing, plus the same Copyright Information which appears on the back sleeve; "℗ 1986 Warner Bros. Records Inc. para los Estados Unidos a Warner Communications Company Publicado y distribuido por Warner Music Argentina S.A. Reservados todos los derechos del productor, de los autores y de los interpretes de las obras reproducidas en este ejemplar, prohibida la reproduccion, regrabacion, alquiler, prestamo, canje, ejecucion publica, radiodifusion y cualquier uso no autorizado de estos fonogramas. SADAIC – BIEM/AADI – CAPIF. INDUSTRIA ARGENTINA". The standard Catalogue number 7599-25501-2 is also displayed at the bottom. There are two slightly different pressings of the Argentina cassette, both have titles printed in Spanish "DIAS DE TRAVESURA" but include different catalogue numbers. The inserts are similar, black with the regular LP cover art at the top with a-ha. The titles are shown in white below the picture, along with the "WB Records" and "wea" logos. The first pressing comes with the catalogue number 4-25501 and also displays the track listing in Spanish on the back sleeve along with "Industria Argentina". The inside of the insert is coloured white with black text; it includes the full track listing in both Spanish and English. There is some Spanish production text which reads; "(P) 1986 Warner Bros. Records Inc. para los Estados Unidos & WEA International Inc. para el resto del mundo". On the inside of the back cover, it displays "SADAIC-BIEM – AADI-CAPIF" along with some Spanish copyright information, there is also some "Wea discos s.r.l. Una Compania del Grupo Warner Communications" text and trademark information; "INDUSTRIA ARGENTINA – MARCAS REGISTRADAS". The "Dolby B" text is also included and is printed and displayed on the inside of the spine in Spanish. The first pressed tape using catalogue number 4-25501 is cream with brown printed text and was released by "EMSSA", it includes the title and track listing in Spanish at the top, with some copyright information at the bottom; "Prohibida la reproduccion, locacion y prestamo de este ejemplar y su radiodifusion o ejecucion plublica. Reservados todos los derechos de los autores de las obras y delproductor de fobogramas". The "wea discos s.r.l", "WB Records" and "DOLBY SYSTEM" logos are also present, along with the catalogue number 4-25501, "SADAIC-BIEM AADI-CAPIF" and "INDUSTRIA ARGENTINA". The second pressing comes instead with the catalogue number 90031 and comes otherwise with the same insert as the first pressing, the "DOLBY SYSTEM" logo on the front cover now includes the full wording printed alongside, which wasn’t displayed on the front cover of the first pressing. The tape was instead released by "EMI" and is white with brown printed text, the layout and design is virtually the same as the first pressing but the catalogue number on the left hand side of the tape has been changed to 90743. The Australian LP comes with a similar layout to the US release including displaying the regular album artworks on the front and back sleeve. There is no barcode shown on the back sleeve but comes instead with the Australian Catalogue numbers for both the LP 25501-1 and (Cassette 25501-4) releases. The usual "Warner Bros. Records Inc." Record Company and Copyright information has been displayed at the lower right of the back sleeve, including the text that the album was; "ALSO AVAILABLE ON CASSETTE AND COMPACT DISC". There is also some Marketing information shown; "Marketed by WEA Records Pty Limited. A Warner Communications Company", plus the regular black "WB Records" logo is present at the bottom left hand corner. The inside of the LP comes with an inner sleeve displaying the regular artwork and full track lyrics, the Catalogue number 25501-1 has been printed instead at the top left hand corner. There is some additional Australian text at the bottom left hand corner which reads; "For Australia & New Zealand lyrics reprinted by permission of CBS Songs". The record comes with white labels and black text, it includes the regular colour "WB Records" logo at the top with the title "A-HA Scoundrel Days" shown underneath. On the left hand side, it displays "STEREO", the Catalogue number 25501-1, reference coding MX212387 and "(P) 1986 WEA International Inc". On the right, it includes side 1 or 2. The lower half of the labels show the full track listing to each side including track credits and lengths, some Manufacturing & Distributing text is displayed underneath; "Manufactured & Distributed by WEA Records Pty. Limited A Warner Communications Company". Displayed around the bottom edge of the labels on both sides is some Copyright information; "ALL RIGHTS OF THE MANUFACTURER AND OF THE OWNER OF THE RECORDED WORK RESERVED. UNAUTHORISED PUBLIC PERFORMANCE, BROADCASTING, LEASING AND COPYING OF THIS RECORD PROHIBITED. WEA RECORDS PTY. LIMITED". The CD release comes instead with a plain black disc with silver text, this edition was also included in the Australian Trilogy box set. 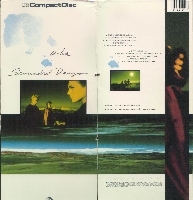 The front cover comes with the regular artworks with the grey handwritten title "a-ha Scoundrel Days" shown along the top. On the back sleeve, the barcode at the top right hand corner displays a different number "9 325583 035296", with the Austrilian catalogue number 9255012 printed underneath. Along the bottom there is also some different Manufacturing and Distributing information which reads; "Warner Bros. Records Inc., A Warner Music Group Company. Artwork Ⓒ 1986 Warner Bros. Records Inc. for the US &WEA International Inc. for the world outside of the US. All Recordings ℗ 1986 Warner Bros. Records Inc. for the U.S. & WEA International Inc. for the world outside of the U.S. All Rights Reserved. Unauthorised duplication is a violation of applicable laws. Marketed in Australia by Warner Music Australia Pty Limited under exclusive licence. Manufactured and distributed by Warner Music Australia A Warner Music Group Company. www.warnermusic.com.au". The release also comes with the usual long fold-out insert displaying the continuation of the landscape on one side, plus track lyrics and regular three pictures which appears on the inner LP sleeve on the other. The Australian catalogue number 9255012 has been additionally included along with some Artwork text; "Artwork Ⓒ 1986 Warner Bros. Records Inc. for the U.S. & WEA Inc. for the world outside of the U.S". The disc itself comes with the silver title "A-HA SCOUNDREL DAYS" displayed and seperated by a line at the top, with the catalogue number 9255012 and same Manufacturing and distributing Information which appears on the back sleeve at the bottom. The cover artwork of the cassette is similar to the US edition but the barcode is missing from the back flap, the inside of the sleeve folds out to include the usual track lyrics and artwork. On the inside of the back flap, it only displays "Warner Bros. Records Inc." and omits the remainder of the text; "3300 Warner Blvd, Burbank, Calif. 91500 - Made in U.S.A.". The catalogue number and "WB" logo are printed in the same orientation as the main title on the spine. The cassette is black with a black stickered label and silver text, the "WB Records" and catalogue number 25501-4 is displayed in the top left hand corner, with the full track listing shown in the centre and Side 1/2 at the top right. Along the bottom, the title "SCOUNDREL DAYS - A-HA" is displayed in the centre with some Marketing information shown underneath on side 1; "Marketed by WEA Record & Tape Distributors Pty. Limited. A Warner Communications Company" and some Copyright information shown instead underneath on Side 2; "ALL RIGHTS RESERVED. UNAUTHORISED PUBLIC PERFORMANCE, BROADCASTING AND COPYING PROHIBITED". Additionally at the bottom left hand corner of both sides is the "COBALT HIGH TECH" logo and at the bottom right of both sides is the "DOLBY HX PRO B NR" logo. The Brazilian LP has all titles in English, unlike the Argentinean release. The title "a-ha Scoundrel Days" has been printed slightly darker and bolder compared to the European release, there is a blue "Warner Music" logo displayed in the top right hand corner with the catalogue number 610.7093 printed in black underneath. On the back sleeve at the bottom right hand side, there is some manufacturing and distributing text in Portuguese; "FABRICADO E DISTRIBUIDO POR RCA/ARIOLA INTERNACIONAL DISCOS LTDA. - AV.ENG. BILLINGS, 2227 - SAO PAULO CGC. 56.697.162/0002-66 - SCDP.DPF.001/69 - S. PAULO - INDUSTRIA BRASILEIRA SOB LICENCA DE WEA DISCOS LTDA". At the top left hand corner, the European catalogue number 759925501-1 is shown and on the right the word STEREO is displayed, along with 36.221 and some further Portuguese text; "SERIE SUPER LUXO TAMBEM EM CASSETE" which translates to; "Super Series also available on luxury Cassette". The green "WB RECORDS" logo is as usual printed in the bottom left hand corner. The label is beige with thin grey stripes, black text and coloured WB-logo at the top of each side. The title A-HA "SCOUNDREL DAYS" is displayed above the centre with some record company reference coding "C.G.C. 56.697.162/0002-66" underneath on the left and catalogue number "610.7093" on the right. The full track listing including its own 8 digit reference number, production credits and track lengths is shown at the lower half of the label. Displayed around the bottom edge is some further manufacturing and distributing text which differs slightly compared to the black sleeve, it reads; "Fabricado e distribuido por RCA/ARIOLA INTERNACIONAL DISCOS LTDA. - Av. Eng. Billings, 2227 - C.G.C. 56.697.162/0002-66 - SP - Todos os direchos reservados Ind. Brasileira - WEA DISCOS LTDA. Rua Itaipava, 44 - Jardim Botanico - Rio de Janeiro - RJ - C.G.C. 42.470.112/0001-56 - Censura - Protocolo Geral nº 273". The release also comes with a cardboard inner sleeve displaying the full track lyrics and usual artworks. The first pressing of the CD was manufactured by "Microservice" and distributed by "BMG Ariola Discos Ltda", it is similar to the original German pressing and comes with the usual front and back cover artworks, it also includes the same folded lyric insert, but there is no barcode included. The catalogue number is also the same 925 501-2. At the bottom of the black sleeve, there is some Brazilian manufacturing and distributing information; "Fabricado pela MICROSERVICE – Microfilmagens e Reproducoes Tecnicas Ltda, CGC 43 359 926/0001-80 – Sao Paulo. Distribuido BMG Ariola Disco Ltda, GCG 56 697 162/0002-66 – SCDPDPF 001/69 – Sao Paulo – Ind. Brasileira Sob Licenca de WEA Discos Ltda". The usual "WB Records" is also displayed at the bottom left hand corner. The disc itself is silver with black text, the usual A-HA logo with the title "SCOUNDREL DAYS" underneath is shown at the top with the track listing displayed down the left hand side, the track production credits, "WB Records" logo and catalogue number are again as usual shown at the lower centre of the disc. Along the bottom edge of the disc, it displays the same Brazilian manufacturing information which appears on the back cover and on the right hand side; it shows the same distributing information. The regular "COMPACT disc DIGITAL AUDIO" logo is also included. The second "Microservice" pressing was released instead by "Warner Music Brasil Ltda". and comes with a multi-coloured branded "BEST SELLERS" sticker on the front of the CD case, there is also a "FLAP F" silver hologram sticker included as well. The layout and design is similar to the earlier "Microservice" release, but now includes a barcode and some different manufacturing and distributing information on the black sleeve; "(P) 1986 WARNER BROS. RECORDS INC. – WARNER MUSIC BRASIL LTDA. C.G.C. 42.470.112/0001-56 – FABRICADO PELA MICROSERVICE MICROFILMAGENS E REPRODUCOES TECNICAS DA AMAZONIA LTDA. – NA US C.G.C. 34.525.444/0001-62 IND. BRAS. DISTRIBUIDO PELA WARNER MUSIC BRASILLTDA. C.G.C. 42.470.112/0012-09". The regular folded insert displaying the track lyrics has also been included but the Catalogue number on the back has been printed in black rather than white. The actual disc is again silver with black text, but is slightly different compared to the earlier "Microservice" pressing; the distributing information on the right hand side has been removed and it now displays some additional production text; "(P) 1986 WARNER BROS. RECORDS INC." and revised catalogue number 759925501-2 at the bottom centre. Along the bottom edge of the disc, the Manufacturing Information is also different, it reads; "WARNER MUSIC BRASIL LTDA., TODOS OS DIREITOS RESERVADOS – PROIBIDA A EXECUCAO PUBLICA – RADIOTELEDIFUSAO E LOCACAO – FABRICADO PELA MICROSERVICE C.G.C. 34.525.444/0001-62 INDUSTRIA BRASILEIRA". The usual "WB Records" and "COMPACT disc DIGITAL AUDIO" logos are as usual displayed on the disc and back sleeve. There is another Brazilian CD release of "Scoundrel Days" which was manufactured instead by "Videolar" and was again distributed by "Warner Music Brasil Ltda", it is similar to the earlier second pressed "Microservice" release and includes the same front and back cover Artworks, it also comes with the silver "FLAP F" hologram sticker on the front of the CD case. The usual folded lyric insert is also included. There is a white barcode displayed on the black sleeve and some manufacturing and distributing information which differs compared to the earlier "Microservice" pressings, it also additionally includes a Website address; "http://www.warnermusicbrasil.com.br – Warner Music Brasil Ltda. – Fabricado na Zona Franca de Manaus por Videolar Multimidia Ltda. – Av. Solimoes, 505 Distrito Industrial CGC 22.797 .096/0001-01 – Industria Brasileira Distribuido pela Warner Music Brasil Ltda. CGC 42.470.112/0012-09". The disc is again silver with black text and includes the usual layout, the manufacturing and distributing information has now been displayed around the outer top rim of the disc; "FABRICADO POR VIDEOLAR ® - INDUSTRIA BRASILEIRA – SOB LICENCA DE WARNER MUSIC BRASIL LTDA. CGC: 42.470.112/0012-09". The "WB Records" and "COMPACT disc DIGITAL AUDIO" logos are included but have now been printed in bold on the disc. The Catalogue number is again the same as before 759925501-2. There is a second Brazilian "Videolar" pressed CD which was as usual distributed by "Warner Music Brasil Ltda" and is similar to the earlier "Videolar" release displaying the regular album artworks. Unlike the first "Videolar" pressing, there is no silver "FLAP F" hologram sticker on the front of the CD case, but comes instead with a round yellow sticker with a white exclamation mark similar to some of the European editions. The usual folded lyric insert is again included. On the back sleeve, the white barcode as usual is displayed in the top right hand corner. Along the bottom, there is some slightly different manufacturing and distributing information shown compared to the earlier "Videolar" release which reads; "Warner Music Brasil Ltda. Uma empresa Warner Music Group. Produzido no Polo Industrial de Manaus por Videolar S.A. – Av. Solimoes, 505 – Distrito Industrial – Manaus – AM. CNPJ04.229.761/0004-13 Industria Brasileira, sob encomenda da Warner Music Brasil Ltda. CNPJ42.470.112/0012-09. Distribuido pela Warner Music Brasil Ltda. CNPJ42.470.112-09. www.warnermusic.com.br". Additionally included on the right hand side of the black sleeve is the "PRODUZIDO NO POLO INDUSTRIAL DE MANAUS CONHECA A AMAZONIA" logo. The layout and design of the disc used is exactly the same as the previous "Videolar" pressing, but on the back sleeve above the barcode and around the centre ring of the actual disc, there is some additional batch issue coding; AA0001000. The Catalogue number 759925501-2 is also the same as the previous release. "Scoundrel Days" was reissued again onto CD in Brazil but was manufactured and distributed instead by "Sonopress" under license to "Warner Music Brasil Ltda", it comes with the same front and back cover artworks and a silver disc, but the layout and manufacturing information around the outer rim has again been changed. There is also an additional "PRODUZIDO NO POLO INDUSTRIAL DE MANAUS CONHECA A AMAZONIA" Flying Amazon Bird logo now included on the disc. On the back sleeve, it again displays some different manufacturing and distributing information: "Warner Music Brasil Ltda., uma empresa Warner Music Group. Produzido no Polo Industrial de Manaus e distribuido por Sonopress Rimo Ind, e Com Fonog. S.A. - Ind. Bras Rua lca, n° 100-A - Distrito Industrial - Manaus - AM - CNPJ 67.562.884/0004-91. Sob Licenca de Warner Music Brasil Ltda - CNPJ 42.470.112/0012-09. Todos os direitos reservados. Proibida a reproducao, execucao publica e locacao desautorizadas sob as penas da lei. O prazo de validade do disco CD ou DVD e indeterminado desde que observado os seguintes cuidados. Armazenar em local seco, livre de poeira, nao expor ao sol, nao riscar, nao dobrar, nao engordurar, nao manter a uma temperatura superior a 55°C e umidade acima de 60g/m3 e segurar o disco sempre pela lateral e polo furo central. DISCO E CULTURA. Denuncie a pirataria: [email protected]". Also included on the back sleeve is the "PRODUZIDO NO POLO INDUSTRIAL DE MANAUS CONHECA A AMAZONIA" Flying Amazon Bird logo and white barcode. Additionally included above the barcode on the back sleeve and around the centre ring of the disc is some batch issue coding; at least two issues are known to exist; AB0000500 & AC0000500. The cassette release was manufactured and distributed by "RCA/ARIOLA INTERNACIONAL DISCOS LTDA." and differs from the European release. The front cover is white with the usual cover shot in the centre with a black border and a small blue "Warner Music Europe" logo. The title is also printed in black uppercase lettering above with the "DOLBY SYSTEM" logo at the bottom. The spine and back sleeve is orange with black text. The track listing is displayed in English on the back sleeve along with its own 8 digit number; it also displays some Production text; "Produzido por Alan Tarney Mags/Pal Waaktaar** (P) 1987 Warner Bros Records Inc." and "Musica e Cultura". On the spine the title "A-HA SCOUNDREL DAYS" is printed in the centre. The "WB" logo with its own 6 digit reference number is on the left and both catalogue numbers to the LP – 610.7093 and cassette – 761.7093 releases are on the right. The "Dolby-B" is also included. The insert comes without any lyrics. The first pressed cassette is cream with brown printed text; it was issued by "BMG". The full track listing with credits is shown at the top, some Brazilian record company information is shown at the bottom of side 1, it reads "WEA DISCOS LTDA - Rua Italpava, 44 - Rio de Janeiro - RJ CGC 42470112/0001-56 SCDP-SR GB DPE 273 76". On side 2 there is instead some Brazilian manufacturing and distributing information displayed at the bottom which reads; "FABRICADO E DISTRIBUIDO POR RCA/ARIOLA INTERNACIONAL DISCOS LTDA. – AV. ENG.BILLINGS, 2227 – SAO PAULO – CGC. 56.697.162/0002-66 SOB LICENCA DE WEA DISCOS LTDA.". The usual "WB Records" logo, "Dolby-B" and catalogue number 761.7093 is also present. The "BMG" has also been engraved into the plastic at the top right hand corner of each side of the tape and on the actual back of the cassette case. The second pressed cassette is also cream, but comes instead with a grey stickered label printed with black text. There are at least two slightly different issues, one was again issued by "BMG" whilst another instead by "RCA", both are otherwise exactly the same and are similar to the first pressing. Additionally the "BMG" or "RCA" has again been engraved into the plastic at the top right hand corner of the tapes on each side, and "BMG" on the back of the cassette case. The Canadian LP release was "Manufactured by WEA Music of Canada Ltd" and is similar to the US edition. At the bottom of the back sleeve, the regular "Warner Bros. Records Inc." Record Company information has been slightly amended to show the Canadian address; "MANUFACTURED BY/FABRIQUE PAR – WEA MUSIC OF CANADA LTD./WEA MUSIQUE DU CANADA LTEE./1810 BIRCHMOUNT RD., SCARBOROUGH, ONT. A WARNER COMMUNICATIONS COMPANY® © 1986 Warner Bros. Records Inc. for the U.S. & WEA International Inc. for the world outside of the U.S. ℗ 1986 Warner Bros. Records Inc. for the U.S. & WEA International Inc. for the world outside of the U.S. All rights reserved. Unauthorized duplication is a violation of applicable laws". The usual "Made in U.S.A" section has been omitted, just leaving a small gap in-between. The back sleeve also displays the green "WB Records" logo at the bottom left hand corner next to the small colour outdoor picture of a-ha, plus that the album is "ALSO AVAILABLE ON CASSETTE AND COMPACT DISC". The regular barcode is printed at the top right hand corner with the track listing displayed as usual in the centre of the sleeve coloured light green for side one and dark green for side two. The front cover is the same as the US edition showing the regular album artworks, title handwritten in grey and embossed ink blotch. The inside of the LP comes with an inner sleeve displaying the full track lyrics and usual artwork, the catalogue number on the right hand side has been changed to 92 55011. The record itself comes with white labels and black printed text, the layout and design is again very similar to the US release displaying the colour "WB Records" logo at the top with the title "A-HA SCOUNDREL DAYS" and Production credits to Alan Tarney, Mags and Pal Waaktaar underneath. On the left hand side, the catalogue number 92-55011 and "CO" is shown. On the right, it displays side 1 or 2. The full track listing to each side is printed on the lower half of the label and includes the track credits and track lengths. Some production and copyright text to; "ATV Music Corp. BMI © 1986 Warner Bros. Records Inc. ℗ 1986 Warner Bros. Records Inc. for the U.S." is displayed at the bottom. Around the outer edge of the label is the same Manufacturing and Distributing Information which appears on the back sleeve; "MANUFACTURED AND DISTRIBUTED BY WEA MUSIC OF CANADA, LTD. A WARNER COMMUNICATIONS COMPANY". The first Canadian cassette was manufactured by "Columbia House", it comes with the regular front cover artworks and folded insert displaying the track lyrics, the spine and back sleeve is coloured black with white printed text. There is a "Super C Cassette" symbol, "CRC", "WB Records" and "DOLBY HX PRO" logos included on the Spine. The Catalogue number W4-25501 (548966C) is also shown. The back sleeve comes with the full track listing and a white barcode, there some manufacturing and copyright information which reads; "Manufactured by Columbia House, a division of CBS Records Canada Ltd. Fabrique par Columbia House, une division de CBS Disques Canada Ltee, 815 Middlefield Road, Scarborough, Ontario, M1V 3M3. Unauthorised reproduction of this recording is prohibited by law and subject to criminal prosecution". On the inside of the back sleeve, there is some additional text about the quality of the "Super C Cassette", plus advice on how to clean, align and demagnetize your cassette deck. The tape itself is black with silver printed text, at the top it displays "SIDE ONE/SIDE TWO" with the track listing to each side underneath. The title "A-HA SCOUNDREL DAYS" is shown along the bottom. The "WB Records" logo, "CRC" and catalogue number W4-25501 is shown on the left hand side, with the "DOLBY HX PRO" logo on the right hand side. The second Canadian cassette was Manufactured and Distributed instead by "WEA Music of Canada Ltd" and comes with a slightly different catalogue number 92 55014 displayed on the spine, it comes with the same front cover artworks to the earlier "Columbia House" release, but on the back cover it displays that it was "Manufactured & Distributed by/Fabrique par WEA Music of Canada Ltd./WEA Musique Du Canada Ltee 1810 Birchmount Rd., Scarborough, Ontario A Warner Communications Company". The tape is again black with silver printed text, but the layout including the logos and some additional Manufacturing and Production information differs compared to the earlier "Columbia House" pressing. At the top, it now displays the title "Scoundrel Days / A-Ha" with the track listing to each side underneath. The "WB Records" logo and Catalogue number as usual is shown on the left, with Side 1/2 and the "DOLBY HX PRO" logo on the right. Along the bottom of side 1, there is some additional production information which reads; "Produced by ALAN TARNEY, MAGS and PAL WAAKTAAR © 1986 Warner Bros. Records Inc. (p) 1986 Warner Bros. Records for the U.S.", whilst on side 2 at the bottom, it includes the same manufacturing information which appears on the back sleeve. Additionally engraved into the plastic at the top centre of side 1 is the text; "MADE IN CANADA", plus the back of the clear cassette case has the "wea" logo engraved. The Chilean cassette release of "Scoundrel Days" comes with the title "Dias Dificiles". The front cover is white and features a smaller cropped picture of the usual album artworks printed in landscape orientation. The a-ha is printed in black at the top in a non-standard font with the title in Spanish ("Das Dificiles") in the same font at the bottom, the "WB Records" logo is also included. The spine is yellow with black text and displays the title "A-HA DIAS DIFICILES", "WB Records" logo, and catalogue number 195145. The "Dolby" logo and "STEREO" is also included. The back cover is white with the full track listing, plus some "Dolby" information printed in black and all shown in Spanish. The inside of the insert is white with black text, listing all the tracks again in both Spanish and English, it includes the track lengths and some track credits. There is some manufacturing and distributing information which reads; "Fabricado y distribuido por EMI Odean Chilena S.A. Santiago - Chile". A "FOTOMECANICA 5551492 GIMO-CROMIA "HERCAL" S.A." logo is also included at the bottom right hand corner. On the reverse of the spine is some Spanish copyright information; "RESERVADOS TODOS LOD DERECHOS DEL PRODUCTOR FONOGRAFICO Y DE LOS TITULARES DE LA OBRA GRABADA. PROHIBIDAS LA REPRODUCCION Y REGRABACION DE ESTE CASSETTE Y SU UTILIZACION PARA LA EJECUCION PUBLICA Y RADIOTELEDIFUSION. PROHIBIDO SU ALQUILER, CANJE O PRESTAMO". 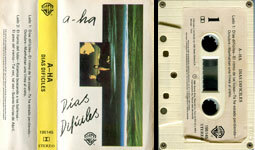 The first pressed tape is white with a white/cream stickered label and black printed text; it displays A-HA and the title "DIAS DIFICILES" at the top with the Spanish track listing to each side underneath. The same manufacturing, distributing and copyright information which appears on the inside of the insert is additionally shown at the bottom of the tape. On the left hand side, it displays side 1/2 and the "Dolby" logo, whilst on the right hand side, the "WB Records", catalogue number 195145 and "STEREO" is shown. The second pressing was again Manufactured and Distributed by "EMI Odeon Chilena S.A." but comes instead with a transparent clear tape with a grey centre piece and white printed text. The font size of the title and track listing at the top is somewhat smaller compared to the first pressing, plus the Manufacturing, Distributing & Copyright information at the bottom has changed to uppercase. The third pressing comes again with the exact same insert as the earlier pressings including having the same artworks, it again was Manufactured and Distributed by "EMI Odeon Chilena S.A.". The colour of the tape is now tinted with a grey centre, plus the actual layout, detail and font size of the text is exactly the same as the second pressing. Some promotional copies of the album come with a wea double sided product fact sheet with details of the album plus information on the band and press sheet (4 sided green sheet featuring a band shot and the text "wea auf touren!" along the bottom). There is also a German made "Club Sonderauflage" (Bertelsmann-Club) edition of the album which has a different catalogue number. This LP is similar to the regular release, but just has "Club-Sonderauflage" underneath the catalogue number on the reverse of the sleeve and on the left hand side of the record label. This LP doesn't come with an inner sleeve. The German "Club Sonderauflage" cassette is similar to the first German made release and also comes with a black tape with grey printed text, it was again "Manufactured in Germany by Record Service GmbH, Alsdorf". The layout and design is the same but includes the additional text; "Club Sonderauflage" above the "WB" logo on the left hand side. the catalogue number has also been changed to 33 530-7. The usual front and back fold-out lyric insert is included but again has the "Club Sonderauflage" text and catalogue number printed at the bottom of the spine. The LP comes with an round blue circle printed onto the front sleeve with "MADE IN GREECE" in English and the Greek version; "ΕΛΛΗΝΙΚΗΣ ΚΑΤΑΣΚΕΥΗΣ" printed in white. The front and back cover artworks is similar to the German manufactured release and displays the same barcode with all three European catalogue numbers at the top right hand corner of the back sleeve. The regular "Warner Bros. Records Inc." Company address and copyright information is also shown at the bottom, there is also an additional Greek Record Company address included; "WEA RECORDS S.A. MESSOGEION 319 HALANDRI MITROPOLEOS 51 SALONICA MADE IN GREECE". At the bottom right hand corner, there is some Greek text; "ΕΚΤΥΠΩΣΗ; Μ. ΟΡΦΑΝΟΣ Τ. ΕΚΑΛΤΣΑΣ ΤΗΛ. 2513308" which displays the Name and telephone number of the Printing Company. The usual green "WB Records" logo is also included at the bottom left hand side of the back sleeve. The record label is white with black text and displays the usual colour "WB RECORDS" Logo at the top of each side with the title "A-HA SCOUNDREL DAYS" underneath. On the left hand side, the catalogue number 925501-1 and "STEREO" is shown, whilst on the right hand side, it displays Side 1/2 in Greek to read; "ΠΛΕΥΡΑ 1/2", plus "AEPI" is also shown. On the lower half of the label, the track listing is displayed both in English and Greek along with some track credits which have been printed in English only and some track lengths. Some Production information is also included; "ATV Music Corp.,BMI (C) 1986 Warner Bros. Records Inc. (P) 1986 Warner Bros. Records Inc. for the U.S. and WEA International Inc. for the world outside of the U.S. A Warner Communications Company". Around the outer edge of the label on both sides is the usual copyright information and displayed along the bottom is "MADE IN GREECE BY G.P.I.". The inside of the record sleeve comes with an additional lyric sheet. The cassette comes with the regular front cover artworks but also has "MADE IN GREECE" and the Greek version "ΕΛΛΗΝΙΚΗΣ ΚΑΤΑΣΚΕΥΗΣ" printed in white on a blue strip across the top left corner of the front sleeve. The insert is white and folds out single-fold to include the full track listing printed in Greek on both the back sleeve and on the inside. The back sleeve also displays that the cassette was "MARKETED AND DISTRIBUTED BY WEA RECORDS S.A. GREECE". The spine comes with the title "A-HA - SCOUNDREL DAYS" printed in black in the centre, with the "WB Records" logo at the top and the "DOLBY SYSTEM" logo, "STEREO" and catalogue number 925501-4 at the bottom. There is some Record Company text displayed on the inside of the insert which reads; "ATV Music Corp., BMI (C) 1986 Warner Bros. Records Inc. (P) 1986 Warner Bros. Records Inc. for the U.S. and WEA International Inc. for the world outside of the U.S. A Warner Communications Company". On the inside of the back sleeve there is also some additional "DOLBY-B" information which has been printed in both Greek and English; "Η κασσέτα αύτή έχει ήχογραφηθή χρησιμοποιώντας τό σύστημα DOLBY-B πού μειώνει τόν θόρυβο. Αν τό κασσετόφωνό σας έχει ήση σύστημα DOLBY, άρκεϊ νά ηατήσετε τόν άναλογο σιακόπτη Αλλιώς, έάν χρειάζεται, έλαττώοτε τά πρίμα (TREBLE)". "(This musiccassette has been recorded using Dolby-B-type noise reduction equipment. On a Dolby equipped deck switch Dolby noise reduction on. On non-Dolby equipment treble setting may be reduced if necessary.)". The tape itself is light grey with a white stickered label and black text, the title "A-HA - SCOUNDREL DAYS" is shown at the top with the track listing to each side displayed in Greek underneath. On side 1, it reads; "1. ΣΚΑΟΥΝΤΡΕΛ ΝΤΕΙΣ 2. ΔΕ ΣΟΥΙΝΓΚ ΟΦ ΘΙΝΓΚΣ 3. ΑΙ'Β ΜΠΗΝ ΛΟΥΣΙΝΓΚ ΓΙΟΥ 4. ΟΚΤΟΜΠΕΡ 5. ΜΑΝΧΑΤΑΝ ΣΚΑΙΛΑΙΝ", whilst on side 2 it shows; 1. ΚΡΑΙ ΓΟΥΛΦ 2. ΓΟΥΙ ΑΡ ΛΟΥΚΙΝΓΚ ΦΟΡ ΔΕ ΓΟΥΕΗΑΣ 3. ΔΕ ΓΟΥΕΙΤ ΟΦ ΔΕ ΓΟΥΙΝΤ 4. ΜΕΙΜΠΗ, ΜΕΙΜΠΗ 5. ΣΟΦΤ ΡΕΙΝΣ ΟΦ ΕΙΠΡΗΛ". 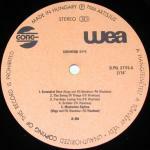 There is a large "WB Records" logo displayed at the top left hand corner, "AEPI (P) 1986" is on the left and "STEREO" and side 1/2 is on the right. The catalogue number 925501-4 is included at the bottom left hand corner. Along the bottom of both sides, there is some copyright information shown, on side 1 it's printed in English; "All rights of the producer and of the owner of the work reproduced reserved. Unauthorised copying, hiring, lending, public performance and broadcasting of this tape prohibited" whilst on side 2, it's shown instead in Greek; "Μέ τήν έηιφύλαξιν ήαντός όικοιώμοτος τού ηαραγωγοϋ καί τοϋ ίόιοκτήτου τοϋ έργου, άηαγορεύεται ή άντιγραφη, δημοαια έκτέλεσις καί ραόιεκηομηή της ηαρούσης ήχογραφήοεως". The text; "MFD by G.P.I. S.A. 410" is additional included at the bottom right hand corner of side 2. Some sealed copies of the cassette also come with a official blue/greyish signed I.F.P.I. anti-piracy seal. The Hungarian LP of "Scoundrel Days" is similar to the UK release, but comes with some different Manufacturing text; "Manufactured in Hungary under license of WEA a Warner Communications Company" in the bottom right hand corner of the back sleeve. Also displayed at the top right of the back sleeve is the Catalogue number SLPXL 37115, circled "BE" symbol and "wea" and "GONG" logos. The actual label on the record is orange with black text and again shows the "Gong" and "wea" logos but much larger. Around the top edge of each side, it displays that it was; "MADE IN HUNGARY Ⓟ 1986 ARTISJUS" and shows "STEREO" and a circled "③③". The title "SCOUNDREL DAYS" is printed in very small text above the centre hole, with the Catalogue number SLPXL 37115-A/B on the right. The track listing to each side including track credits is shown at the lower half of the label with A-HA underneath. Around the outer bottom edge of the label (again on both sides) is some Copyright information which is printed in both Hungarian and English: "A HANGFELVETELT A TORVENY VEDI . UNAUTHORIZED COPYING OF THIS RECORD IS PROHIBITED". The album doesn't come with lyric sheet. The Hungarian cassette release of "Scoundrel Days" was manufactured by "GONG under license of WEA" and comes with the regular front and back cover artworks, there is no barcode shown on the back sleeve. On the front cover it additionally includes the "wea", "GONG" and "DOLBY SYSTEM" logos. The catalogue number at the bottom of the spine has been changed to MKL 37115 and includes a circled (BE) Symbol. The insert folds out single fold to display the full track listing on the right hand spine, it also includes the usual "Warner Bros. Records Inc." production and copyright information and "Warner Bros. Records Inc." contact address. Along the bottom, it displays that it was "Manufactured in Hungary under license of WEA". There is no full track lyrics or artworks included inside. The tape itself is light grey with a white stickered paper label and black printed text, the title "SCOUNDREL DAYS" is displayed in small text at the top with the track listing to each side shown underneath. The catalogue number MKL 37115, "Stereo" and "Artisjus" is shown on the left and the "DOLBY SYSTEM®" and "(P) 1986" is shown on the right. Along the bottom of both sides, it displays that it was "Made in Hungary" and includes some additional Hungarian text; "A hangfelvetelt a torveny vedi" which translates to "The phonograms protected by law". There is also some copyright information; "Unauthorised copying of this tape is prohibited", plus the "wea" and "GONG" logos have also been displayed. The cassette has a similar cover to the US release and folds out to reveal the song lyrics. At the bottom of the front cover are the words "HANYA UNTUK DIJUAL DI INDONESIA" in black. The regular U.S. catalogue number can be seen at the bottom of the spine and on the cassette, but there is also another number "W0102-8" printed also at the bottom of the spine. The usual barcode and full track listing in included on the back sleeve, plus there is some additional Trade mark information which reads; "Trade mark and recording licensed to Aquarius Records for manufacture and sale in Indonesia only". Some copies also come with an official "LUNAS P P N" leafed sticker. There are actual two different pressed tapes which come with the exact same folded insert, the first pressing comes with a blue tape with white printed text, and the second pressing comes instead with a clear/grey transparent tape again with white printed text. The layout and design on both pressings is otherwise exactly the same; the title "A-HA SCOUNDREL DAYS" is shown at the top with the track listing underneath. The "WB Records" logo is included on the left and the Catalogue number 9 25501-4, "STEREO" and side 1/2 is on the right. Some production and copyright information is displayed at the bottom of both sides; "(P) & © 1988 Warner Bros. Records, Inc. for the U.S. and WEA International Inc. for the world outside of the U.S. ALL RIGHTS RESERVED. UNAUTHORIZED COPYING PUBLIC PERFORMANCE BROADCASTING OF THIS RECORDING FORBIDDEN". The Israel LP is very similar to the U.S. edition including the same front cover artworks and handwritten title in grey. Unlike the U.S. edition, the regular ink blotch included on the front sleeve hasn’t been embossed. On the back sleeve, there is no barcode included in the top right-hand corner but instead displays the Catalogue number BAN 9 25501-1. The regular track listing to each side is displayed in the centre of the sleeve, with "SIDE ONE" printed in light green and "SIDE TWO" in dark green. The usual landscape scene including the picture of the three band members is shown at the lower half of the sleeve, with the "WB RECORDS" logo located at the bottom left-hand corner. The logo has been printed however in black rather than the usual green. The regular "Warner Bros Records Inc." contact address and copyright information is displayed including the text "Made in U.S.A." The back sleeve also shows that the album was "ALSO AVAILABLE ON CASSETTE AND COMPACT DISC". At the bottom of the back sleeve, there is some additional Israel manufacturing and distributing information printed in Hebrew and is displayed in bold ;" מיוער ומופץ ע״י החברה הבללית למוטיקה בע״ם, החלזון 4, רמת״גן, תוצרת הארץ". The English translation is included underneath; "MANUFACTURED AND DISTRIBUTED BY THE GENERAL MUSIC CO. LTD. RAMAT-GAN, ISRAEL. MADE IN ISRAEL". The record itself comes with white lined labels displaying a slightly different coloured "WB RECORDS" logo at the top. The usual red colour is now printed in purple with orange top section now in light blue. The title "A-HA SCOUNDREL DAYS" is displayed underneath. On the left-hand side, it shows "SIDE 1" or "SIDE 2" and "STEREO", whilst on the right-hand side, the Catalogue number BAN 925501-1 and "ACUM" is shown. At the lower half of the label is the full track listing to each side including track credits and track lengths. Some other additional record company and production text is included underneath; "ATV MUSIC CORP BMI PRODUCED BY ALAN TARNEY *PRODUCED BY MAGS AND PAL WAAKTAAR (P) & (C) 1986 WARNER BROS RECORDS. a Warner Communication Company". At the very bottom of the label (again on both sides), shows that the album was "MADE IN ISRAEL", the text has been additionally printed in both English and Hebrew; "מיוצר בישראל". Around the outer edge of the label includes the text; . "Warner Bros. Records Inc." printed several times. The inside of the LP comes with a colour double-sided lyric sheet rather than an inner sleeve and includes the Israel Catalogue number BAN 9 25501-1 printed at the top of one side. The cassette release is similar to the US release and includes the regular artworks and full track lyrics. On the back sleeve the usual barcode has been replaced instead with some manufacturing and distributing text which has been printed in both Hebrew and English; "החליין 4, רמתיגן, הכללית למיםיקה בע"מ, מְיוּצָר ןמןפץ עיי החברה . MANUFACTURED AND DISTRIBUTED BY THE GENERAL MUSIC CO. LTD. RAMAT-GAN, ISRAEL. MADE IN ISRAEL". On the inside of the back sleeve, there is No copyright or "Dolby" text included and the "Warner Bros. Records Inc. 3300 Warner Blvd., Burbank, Calif. 91510" information is displayed without; "Made in U.S.A." being present. The "Dolby" logo on the spine has also been removed and the catalogue number has been changed to MCB 925501-4. 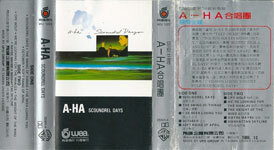 The tape is white with blue printed text and displays the title "A-HA/SCOUNDREL DAYS" at the top with the track listing underneath. On the left hand side, it includes "STEREO", "MONO" and side 1/2, whilst on the right hand side, it shows the catalogue number, "WARNER", "ACUM" and the text; "℗ & Ⓒ 1986". Along the bottom of both sides is some copyright information; "All rights of the producer and of the owner of the work reproduced reserved. Unauthorized copying, hiring, lending, public performance and broadcasting this cassette prohibited". The Italian LP release is similar to the US edition but doesn’t include a barcode or Catalogue number on the back sleeve. The regular "Warner Bros. Records Inc." Record Company and Copyright information is included at the lower half of the sleeve, along with the text; "ALSO BEING AVAILABLE ON CASSETTE AND COMPACT DISC". There is also some additional Italian Manufacturing and Distributing Information shown which reads; "Made and Distributed in Italy by Wea Italiana S.p.A. Milano A Warner Communications Company". The usual black "WB Records" logo is also displayed at the bottom left hand corner of the back sleeve. The regular artwork is included on the front sleeve with the handwritten grey title and embossed ink blotch. The release also includes an inner sleeve similar again to the US edition but the Catalogue number on the right hand side has been changed to 92 5501-1. The record itself comes with white labels and black printed text, the regular colour "WB Records" logo is displayed at the top with the title "A-HA SCOUNDREL DAYS" and Production credits to Alan Tarney, Mags and Pal Waaktaar included underneath. On the left hand side, it shows the "S.I.A.E." logo with the Catalogue number 92 5501-1 and side 1 or 2 on the right. At the lower half of the label, it includes the full track listing to each side, along with track credits and lengths. There is also some Record Company text; "ATV Music Corp. BMI © 1986 Warner Bros. Records Inc. ℗ 1986 Warner Bros. Records Inc. for the U.S.". Around the outer edge of both sides is some Manufacturing and Copyright Information; "MADE IN ITALY BY WEA ITALIANA SPA A WARNER COMMUNICATIONS COMPANY RISERVATI TUTTI I DIRITTI DEL PRODUTTORE FONOGRAFICO E DEL PROPRIETARIO DELL OPERA REGISTRATA SALVO AUTORIZZAZIONI. SONO VIETATE LA DUPLICAZIONE. LA LOCAZIONE DI QUESTO DISCO PER PUBBLICA ESECUZIONE E RADIODIFFUSIONE". The Italian cassette was released by "Warner Bros" and comes with similar front and back cover artworks to the US release, there is no barcode included on the back sleeve and the track listing also shows track length numbers. The spine comes with a different catalogue number 92 5501-4 and includes the wording "DE LUXE", there is also a red round official Italian "SIAE" stamp mark included. The insert folds out to include the usual artworks and full track lyrics. There is some additional manufacturing and distributing text shown on the inside of the back sleeve which reads; "Made and Distributed in Italy by WEA Italiana S.p.A. – Milano". The tape itself is black with black stickered labels and silver printed text, it displays the title "A-HA / SCOUNDREL DAYS" at the top with the track listing to each side underneath, there is some Italian manfacturing and copyright information which reads "Riservati tutti I diritti del produttore fonografico e del proprietario dell' opera registrata, Salvo autorizzazioni, sono vietate la duplicazione, la locazione e I' utilizzazione di questo disco per pubblica esecuzione e radiodiffusione. Made in Italy by WEA Italiana spa A Warner Communications Company" displayed at the bottom of each side. The catalogue number 92 5501-4, "STEREO" and "DOLBY SYSTEM" logo are shown at the top left hand corner, with the "WB Records" logo located on the left and side 1/2 and "S.I.A.E" on the right. Warner-Pioneer Corporation manufactured the Japanese LP press of "Scoundrel Days"; it comes with the regular front and back cover artworks including the landscaped scene and handwritten title in grey. On the back sleeve, the regular track listing is displayed in the centre of the sleeve with "SIDE ONE" coloured light green and "SIDE TWO" dark green. At the top left-hand corner, the barcode comes with a different number "T4988 014 43041 8" compared to the regular UK or U.S. release and includes some additional "H.11.28" coding underneath. At the bottom left-hand corner of the back sleeve is the usual green coloured "WB RECORDS" logo. The regular Warner Bros. Records Inc. contact address and copyright information is printed at the lower right of the sleeve but has been amended to include that the LP was Made In Japan; "Warner Bros. Records Inc., a Warner Communications Company ® 3300 Warner Blvd., Burbank, Calif. 91510. 75 Rockefeller Plaza, New York, New York 10019 © 1986 Warner Bros. Records Inc. for the U.S. & WEA International Inc. for the world outside of the U.S. ℗ 1986 Warner Bros. Records Inc. for the U.S. & WEA International Inc. for the world outside of the U.S. Made in Japan. All rights reserved. Unauthorized duplication is a violation of applicable laws". The back sleeve also displays that it was "ALSO AVAILABLE ON CASSETTE". The LP additionally comes with a white obi-strip with black and green printed text. Along the top is a series of black squares on the white background giving a filmstrip effect, the Catalogue number P-13400 and price tag ¥2,800 are included underneath. There is a green strip with the slogan "I BELIEVE IN A-HA" above the album title "SCOUNDREL DAYS" which has been listed down the front of the obi-strip. The title comes in both large green Japanese lettering with the English translation in black alongside to the left. There is some further Japanese text printed in black and listed on either side of each title. At the lower half of the obi, it contains a continuation of the landscaped scene to match up with the front sleeve; a large white A-HA logo is included on top of the landscaped artwork. At the bottom end of the obi, which is, coloured white, it contains some English text; "Produced by" and "featured single" printed in black, the remaining text located in-between, which corresponds to both, is listed in green and has been printed instead into Japanese. There is an additional green strip along the bottom, which includes some further white Japanese text. There is some other smaller Japanese text, also shown in black, which refers to the Japanese Cassette album PKG-3206 release. The "WB PIONEER" and "WB RECORDS" logos are also present. The reverse of the obi is white with again the black and white squares making up the filmstrip along the top. There is a green A-HA logo included underneath. The remainder of the top half of the back obi-strip contains some Japanese information about the album in a mixture of black and green text. Like the front obi, there is a continuation of the landscaped artwork to match up with the back of the sleeve. At the bottom of the back obi, there is some other black printed Japanese text, which refers to "A-HA/THE PIX" and their world tour in Japan dating back to 1986. The inside of the album includes a folded sheet with the full track lyrics listed in both English and Japanese. First pressings of the LP came with a limited edition sheet of 19 colour stickers and a black and white postcard containing some adverts of the "Best 9" Japanese albums including A-ha and other artists, plus a 13-question quiz on the reverse. The record itself comes with white labels and black printed text. 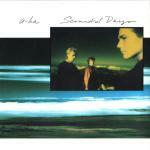 The colour "WB RECORDS" logo is displayed at the top with the title "A-HA SCOUNDREL DAYS" and regular production text; "PRODUCED BY ALAN TARNEY *PRODUCED BY MAGS AND PAL WAAKTAAR" underneath. The "JASPAC" logo, Catalogue number P-13400, including side reference (P-13400-1/2) and 331/3RPM are included on the left, with "SIDE 1" or "SIDE 2" and "STEREO" on the right. The full track listing to each side is displayed at the lower half of the label and includes track credits and track lengths. Some other reference to the record company; "ATV Music Corp. BMI © 1986 Warner Bros. Records Inc. ℗ 1986 WEA International Inc." is included along with the text; "a Warner Communications Company" and company logo, which is also printed at the lower half of the label. Around the outer rim of the disc on both sides is some manufacturing and copyright Information, which reads; "MADE BY WARNER-PIONEER CORPORATION, JAPAN, UNDER LICENSE FROM WARNER BROS. RECORDS INC., U.S.A. ALL RIGHTS OF THE MANUFACTURER AND OF THE OWNER OF THE RECORDED WORK RESERVED. UNAUTHORIZED PULIC PERFORMANCE BROADCASTING AND COPYING OF THIS RECORD PROHIBITED". First pressings of the CD come with a limited edition double-sided signed photo card in addition to a folded white Japanese lyric sheet. It also includes a green front and back coloured obi-strip with blue printed text. On the front of the obi near the top it displays the slogan; "I BELIEVE IN A~HA", the title "Scoundrel Days" is then shown down the left hand side but displayed in Japanese along with a large a-ha in the centre, there is some additional Japanese text included down the right hand side, the full track listing is also shown in Japanese at the bottom, along with a white "WB" logo. On the obi spine, the coloured scheme has been reversed to include a blue background with green printed text and is different compared to the front and back of the obi-strip, the "COMPACT disc DIGITAL AUDIO" logo is displayed at the top in white with a-ha and the title again in Japanese and printed in green. The catalogue number 32XD526 and "Warner Bros. Pioneer Corporation" logo is also displayed in white at the bottom, along with a price tag of ¥3,200. The obi back comes with some further Japanese text and includes the wording "WARNER-PIONEER CORPORATION" and a blue barcode. The text on the reverse and spine of the CD sleeve differs slightly from the European release - on the reverse the track listing is printed in black for side 1 and green for side 2. The regular Production credits to Alan Tarney, Mags and Pal Waaktaar are again shown in black. At the bottom of the back sleeve, the same "Compact Digital Disc" recording information and "Warner Bros Records Inc." Record Company and Copyright text is shown, it also displays that it was "Printed in Japan" and includes the catalogue number 32XD-526 alongside. On the spine is a mixture of black and white letters to make the text more readable over the artwork picture. The disc itself is silver with black text (similar to the Japanese Club releases); it includes a red "WB RECORDS" logo on the left and comes with a red trim around the edge. The usual title A-HA with "SCOUNDREL DAYS" underneath is displayed at the top with the full track listing down the right hand side. The catalogue number and "℗ 1986 WEA International Inc." is additionally shown on the left, with the Production information to Alan Tarney, Mags and Pal Waaktaar, plus the "COMPACT disc DIGITAL AUDIO" and "JASPAC" logos at the lower centre. Around the outer edge of the disc is some manufacturing and copyright text; "MADE BY WARNER PIONEER-CORPORATION JAPAN. ALL RIGHTS OF THE MANUFACTURER AND OF THE OWNER OF THE RECORDED WORK RESERVED. UNAUTHORIZED DUPLICATION IS A VIOLATION OF APPLICABLE LAWS". "MADE IN JAPAN" is also displayed at the bottom of the disc. Some copies of the CD album has Japanese symbols etched into the centre ring of the disc indicating that it is a promo copy and also a white and red promo sticker on the back insert. There was a re-issue (10 April 1989) of the Japanese "Scoundrel Days" CD album which comes with a white "Forever Young Series" obi-strip with a blue and yellow coloured spine. On the front of the obi, the "Forever Young Series" text is displayed near the top in light blue, with a large a-ha printed in red and the title "Scoundrel days" in Japanese displayed down the left hand side in black. The Japanese track listing at the bottom is also shown in black with the track numbers in red. On the obi spine, the "COMPACT disc DIGITAL AUDIO" logo is displayed at the top in white with a-ha and the title printed again in Japanese but now in yellow. The catalogue number 18P2667 and "Warner Bros. Pioneer Corporation" logo is also displayed in white at the bottom, along with a price tag of ¥1.875 shown in black on a yellow background. There is some further Japanese text printed on the back of the obi, along with "WARNER-PIONEER CORPORATION" and a black barcode. The album itself comes with the same regular front and back cover artworks similar to the earlier release, it again displays on the back sleeve that it was "Printed in Japan". Unlike the first pressing, one of the spines shows the title in Japanese rather than English, and the release also comes with the regular fold-out colour insert and Japanese folded lyric sheet. The layout of the disc is also the same as before, silver with black text and includes the red WB logo and outer red trim, it also displays the revised catalogue number 18P2-2667. Another issue (25 April 1997) comes with a yellow and white "Hot Price" obi-strip displaying a red and yellow "bomb" hot price logo. The album has a different catalogue number WPCR-1086 compared to the first two pressings. It comes in a white tray, rather than grey and is similar to the previous issues, but comes instead with a five page white lyric booklet with the tracks in Japanese, rather than the folded lyric sheet. The regular front fold-out colour insert is also included. On one of the spines, like the previous "Forever Young" CD release, the title "Scoundrel Days" has been printed in Japanese. Some copies also come with a white sticker with red promo text stuck on the back sleeve and the word "SAMPLE" etched in black around the centre of the disc suggesting that they were used for promotional purposes. The regular Japanese cassette release comes in a white backed cassette case with a long wrap-around sleeve. The front cover is blue with the regular LP artworks displayed at the top, the a-ha logo is shown in yellow with the titles in white, both printed in English and Japanese. The Catalogue number PKG-3206, "STEREO", "WB RECORDS" and "DOLBY SYSTEM" logos are also included. The back sleeve is white with black text; the full track listing is shown along with "MADE IN JAPAN" and "(P) 1988 WEA International Inc". The left spine is coloured blue with the a-ha logo again printed in yellow and the title "SCOUNDREL DAYS" in white, the "WB RECORDS" logo and catalogue number are shown in black. There is a small shot of the cover artwork on the right hand spine, the title has now been displayed in Japanese and coloured green, and it also includes a black A-HA logo. At the bottom of the spine, the catalogue number is printed in white on a blue background and there is a white price tag of ¥2,800 which is printed instead on a red background. The right hand fold out insert comes with "I BELIEVE IN A-HA" and some Japanese text at the top and includes the full track listing underneath in both English and Japanese. There is also some manufacturing information; "MADE BY WARNER PIONEER CORPORATION, JAPAN, UNDER LICENSE FROM WEA INTERNATIONAL INC., U.S.A.". Along the bottom, there is a large white barcode which comes with a different number T4988 014 30845 8 compared to the European release. On the inside of the folded insert, it advertises the three earlier Japanese A-ha cassette albums; the track listing along with the track credits is also displayed. There is some "DOLBY SYSTEM" and copyright information displayed at the bottom in both English and Japanese. 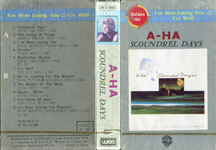 The actual tape is white with black stickered labels and white text; it displays the title at the top "SCOUNDREL DAYS/A-HA" with the track listing to each side underneath. The same manufacturing information which appeared on the folded insert is included at the bottom. Additionally included inside is a grey paper folded sheet with black text, it contains all of the full track lyrics both in English on one side and Japanese on the other. The LP comes with a fold out Korean insert. Some copies of the LP have a blue toned sleeve, it is thought that these are unofficial releases. The Korean cassette comes in a card slipcase. The front and back cover is grey with the regular LP cover artwork printed on the front with the A-HA logo in burgundy and black title "SCOUNDREL DAYS" above. Along the top is a blue strip with "I've Been Losing You Cry Wolf" in yellow, plus a red circle with gold edging displaying the text "Golden Hit" in white. A black "WB RECORDS" logo is included along the bottom. The reverse also includes the same blue strip advertising the same two tracks along the top, but coming without the "Golden Hit"" circular logo. Displayed down the left hand side of the back cover is a large white "A" & "B" with the full track listing in black and shown both in English and Korean. Along the bottom, it contains the album release date information; "86-974 (86.11.13)" and a Production date; "Ⓟ Nov. 25 1986". There is also some Manufacturing information included; "Manufactured by Oasis Records Co. under license from WEA Int’l Approved by K.E.C.P.P. Ministry of Culture and Information Registration No. 16." and that the album was "Printed in Korea". On each side of the spines of the slipcase, the Catalogue number OWT-440 is printed at the top, along with a yellow "STEREO" logo and a mini picture of Paul. One spine has A-HA with the title "SCOUNDREL DAYS" printed in English using the same colour format as the front cover, whilst the other side has it translated into Korean. At the bottom of the English titled side, it includes a black and grey "wea" logo, whilst on the other side; it has been replaced by a black and grey "OASIS RECORDS" logo. The tape itself is housed in a standard clear and black plastic case within the card slipcase; it is coloured white with a red, grey and white stickered label displaying black and red printed text. Along the top of each side is the full track listing printed in black on a white background. There is a thick red line which separates the lower section of the label which is coloured grey. To the left of the centre cogs are the "wea" & "OASIS RECORDS" logos shown in white, whilst on the right hand side, it instead displays the Catalogue number OWT-440, Side 1 or 2 and the "Dolby Stereo" logo, again all in white. Along the bottom of the labels on each side, shown in red, is the same Manufacturing and Printing information which appears on the back of the slipcase. The Malaysian cassette of "SCOUNDREL DAYS" comes with the same front and back cover as the US release displaying the usual album artworks and full track lyrics, there is an additional small blue and white "Warner Music Europe" logo sticker included on the front cover. On the inside of the back cover, the usual ""Dolby" text has been omitted and replaced instead with some Malaysian record company information; "EDARAN WEA RECORDS SDN BHD No. 17 Jln 1/57A Bt 3 Jln Ipoh, Kuala Lumpur Dicetak oleh Culture Press Sdn Bhd". The tape itself is light grey with a grey and white striped paper stickered label and comes in a light grey backed case instead of the usual charcoal coloured one. The usual "Warner Music Europe" logo is also engraved onto the back of the cassette case. The Catalogue number is 4-25501. The LP has a similar cover to the UK release except for a small Warner logo in the top right of the sleeve plus catalogue number LWB-6543. On the reverse the tracks are written in both English and Spanish with some Spanish Production credits; "PRODUCIDO POR: Alan Tarney Exc. *Producido por Mags y Pal Waaktaar" included near the bottom. There is also some Spanish Manufacturing and strict Copyright information shown; "Muy importante: Este fonograma es una obra intelectual protegida en favor de su productor Ⓟ Ⓒ 1986 WARNER BROS. RECORDS INC. La titularidad del derecho contenido en el fonograma se encuentra reconocido e inscrito en el Registro Publico del Derecho de Autor. Direccion General del Derecho de Autor-Secretaria de Educacion Publica. Se prohibe su copia o reproduccion parcial o total. La violacion de esta prohibicion esta penada conforme a los articulos 336 del Codigo Penal 135 y 136 de la Ley Federal sobre el Derecho de Autor Vigente. HECHO EN MEXICO POR PRODUCCIONES WEA, S.A. DE C.V. ACAPULCO 37 MEXICO 06140, D.F. UNA CIA. DEL GRUPO WARNER COMMUNICATIONS MARCAS REGISTRADAS". At the bottom left hand corner, the "wea" and "WB Records" logos are shown, whilst at the right hand corner, there is some "amprofon" text and "EL DISCO ES CULTURA". The actual record comes with a white label with the colour "WB Records" logo at the top and the title "A-HA SCOUNDREL DAYS" underneath. The catalogue number is shown on the left hand side, with "LADO A/B" and 33 1/3 on the right. The full track listing is again shown in Spanish and English along with some Spanish track credits and Production information. Along the bottom edge of each side is some additional copyright text; "PROHIBIDA LA REPRODUCCION Y LA RADIODIFUSION DE ESTE DISCO RESERVADOS TODOS LOS DERECHOS DEL PRODUCTOR FONOGRAFICO". The inside of the sleeve also comes with a lyric sheet. The Mexican cassette comes with a cropped picture of the regular cover shot, displaying a landscaped scene underneath. The spine and back sleeve is blue with white text, the full track listing in displayed on the back sleeve. The title "A-HA SCOUNDREL DAYS" is printed landscape on the spine, with the catalogue number CSWB-6543, "Dolby", "wea" and "WB Records" logos included. The inside of the insert is white with black text and displays the full track listing in both English and Spanish, along with track lengths and track credits. Some Spanish production text is shown at the bottom; "PRODUCIDO POR: Alan Tarney Exc. *Producido por Mags y Pal Waaktaar TODAS EDITADAS POR: ATV MUSIC CORP. BMI". On the inside of the back sleeve, there is some Spanish Copyright information displayed; "MUY IMPORTANTE Este fonograma es una obra intelectual protegida en favor de su productor Derechos reservados (P) (C) 1986 WARNER BROS RECORDS INC. La titularidad de los derechos contenidos en el fonograma se encuentra reconocida y protegida CONFORME A LA LEY SE PROHIBE SU COPIA O REPRODUCCION PARCIAL O TOTAL, SU ALQUILER Y SU EJECUCION PUBLICA Estas prohibiciones estan penadas conforme a los Articulos 386 del Codigo Penal y 135 y 136 de la Ley Federal sobre el Derechos de Autor y demas normas legales aplicables vigentes", along with the catalogue number and "wea" logo. The inside of the spine includes some other Spanish manufacturing and contact address details; "Hecho en Mexico por PRODUCCIONES WEA S.A. de C.V. Acapulco No. 37 Mexico 06140 Tel. 5-53-66-88 Una compania del grupo WARNER COMMUNICATION MARCA REGISTRADA". 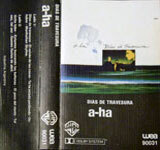 The cassette itself is white with beige labels and black text, it displays the title at the top "A-HA / SCOUNDREL DAYS" with the track listing in Spanish to each side. The "WB Records" logo is shown on the left and the catalogue number CSWB 6543 and side 1/2 on the right. Along the bottom of both sides is some Production and Copyright text; "P y C 1986 Warner Bros. Records Inc. UNA COMPANIA DEL GRUPO WARNER COMMUNICATIONS HECHO EN MEXICO". The LP release is similar to the US pressing and comes with the regular front and back cover artworks. The catalogue number 25501-1 is displayed in the top right hand corner of the back sleeve and replaces the usual barcode which has been omitted. At the bottom, the usual "Warner Bros. Records Inc" contact address and copyright information is shown along with the text; "ALSO AVAILABLE ON CASSETTE AND COMPACT DISC". There is some additional marketing information which reads; "Marketed by wea Records Limited, P.O. Box 2915, Auckland, New Zealand". The record itself comes with a white label with the colour "WB RECORDS" logo at the top and title "SCOUNDREL DAYS" printed in black underneath. On the left of each side, it displays some Production text; "Ⓟ 1986 Warner Bros. Records", with the catalogue number 255011 and side 1/2 being on the right hand side. At the lower centre of the label it comes with full track listing to each side along with track credits and track lengths. The "Manufactured and Distributed by WEA Records Limited a Warner Communicatons Company" text has been printed in bold. Around the outer rim of the label is some copyright information; "ALL RIGHTS OF THE MANUFACTURER AND OF THE OWNER OF THE RECORDED WORK RESERVED. UNAUTHORISED PUBLIC PERFORMANCE, BROADCASTING, LEASING AND COPYING OF THIS RECORD PROHIBITED. WEA RECORDS LIMITED". The record also comes with an inner sleeve containing all the track lyrics and regular artwork. The cassette has a white sleeve with similar artworks to the LP release, the insert folds out single fold and comes with a yellow spine with black text. The track list is printed in black on the back cover and on the inside of the sleeve. There is some Manufacturing, Copyright and Marketing information additionally displayed inside which reads; "Warner Bros. Records Inc., a Warner Communications Company ® 3300 Warner Blvd, Burbank, Calif. 91510. 75 Rockefeller Plaza, New York, New York 10019 © 1986 Warner Bros. Records Inc. for the U.S. & WEA International Inc. for the world outside of the U.S. ® 1986 Warner Bros. Records Inc. for the U.S. & WEA International Inc. for the world outside of the U.S. Made in U.S.A. All rights reserved. Unauthorized duplication is a violation of applicable laws. Marketed by WEA Records Limited, P.O. Box 2915, Auckland, New Zealand". The title "AHA SCOUNDREL DAYS" and catalogue number 25501.4 is also shown on the spine and on the inside, with the "WB Records" logo included at the bottom of the spine only. 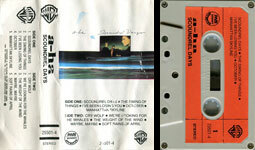 The tape itself is black with a white stickered label and red printed text, the title "SCOUNDREL DAYS" with the A-HA and the full track listing is displayed at the top. On the left hand side, the "WB Records" logo is shown with the "Dolby" and "Cassette symbol" logos, side 1/2, "STEREO" and catalogue number 255014 on the right hand side. Along the bottom of both sides, there is some Manufacturing and Distributing text; "Ⓟ 1986 Warner Bros. Records. Manufactured and Distributed by WEA Records N.Z. Limited". The Peru LP comes with a regular colour front sleeve, but the back sleeve has instead been printed in black and white. The track listing displayed in the centre is shown in bold and printed in a different font compared to the regular release. There is no barcode included, but instead located in the top right hand corner is the Catalogue numbers for both the Peruvian LP; "P-WBR-0255011.8" and that the album was also available on Cassette; "(Tambien disponible en cassette: C-WBR-0255011.2)". The word "STEREO" is additionally shown. There is a large "WB RECORDS" logo displayed in the top left hand corner. Along the bottom of the back sleeve is some Spanish Manufacturing information again printed in black text which reads "FABRICADO POR "EL VIRREY" INDUSTRIAS MUSICALES S.A. EL DISCO ES CULTURA". Also displayed is some piracy information which includes an image of cassette tape with crossbones and some Spanish text;- "PIRATERIA FONOGRAFICA LA COPIA DE ESTE FONOGRAMA CONSTITUYE DELITO DE ESTAFA, PENADO CON PRISION DE HASTA 6 ANOS (LEY No 23535)". The record has pinkish/light brown labels with printed lines and includes the large colour "WB RECORDS" logo at the top. All of the song titles are printed in Spanish and English, along with credits and track lengths. The usual Production information to the band members, Alan Tarney and ATV Music displayed under the full track listing has also been printed in Spanish to read "(Producido por Mags y Pal Waaktaar. Producido por Alan Tarney. Todas los termas bajo ATV MUSIC CORP. BMI)". On the left hand side, the Catalogue number; "P – WBR 0255011.8" and "ST 33" is shown, whilst on the right, side "1" or "2", "STEREO" and "℗" are displayed. Around the outer rim of the label is some Manufacturing information which is similar to that shown on the back sleeve; "MANUFACTURADO POR "EL VIRREY" INDUSTRIAS MUSICALES S.A. INDUSTRIA PERUANA REG. IND. 12428", plus there is also some additional Spanish Copyright information;- "RESERVADOS TODOS LOS DERECHOS DEL PRODUCTOR FONOGRAFICO Y DEL PROPIETARIO DE LA OBRA REGISTRADA - PROHIBIDA LA REPRODUCCION EJECUCION PUBLICA Y RADIO TELEDIFUSION DE ESTE DISCO". The release doesn't include an inner sleeve. The cassette comes with a white fold-out sleeve displaying the regular artwork picture in a square in the centre of the front sleeve which doesn’t look very official nor high quality. The title "SCOUNDREL DAYS A-HA" is printed above in black along with the catalogue number "C-WBR 0255011-2", "STEREO" and "WB" logo. Along the bottom there is some manufacturing information again shown in black; "FABRICADO POR "EL VIRREY" INDUSTRIAS MUSICALES S.A. R.I. 12428". On the spine, the title and a-ha logo are printed landscape in black with the "WB" logo shown orientated at the top and the catalogue number at the bottom. The full track listing is shown all in Spanish on the back cover, along with side A and side B which is displayed as "LADO: A" and "LADO: B". The right hand fold-out sleeve comes with the title again printed in black at the top with a-ha, the full track listing is shown in both Spanish and English along with track credits and track lengths. Along the bottom, there is a picture of a cassette tape with crossbones displaying some Spanish Copyright Warning information; "PIRATERIA FONOGRAFICA LA COPIA DE ESTE FONOGRAMA CONSTITUYE DELITO DE ESTAFA, PENADO CON PRISION DE HASTA 6 ANOS (LEY Nº 23535)". The tape is clear transparent with a bright orange sticker label with black text; the title "SCOUNDREL DAYS A-HA" is displayed along the top of both sides, with the "WB RECORDS" logo included in the top left hand corner. The catalogue number is shown on the left hand side with side 1/2 and "STEREO" displayed on the right hand side. Along the bottom of both sides is some Spanish copyright and manufacturing information which reads; "QUEDAN RESERVADOS TODOS LOS DERECHOS DEL AUTOR Y DEL PRODUCTOR DE FONOGRAMAS ESTA PROHIBIDA LA COPIA. LOCACION Y EJECUCION PUBLICA DE ESTE FONOGRAMA. MANUFACTURADO POR "EL VIRREY" INDUSTRIAS MUSICALES S.A. - INDUSTRIA PERUANA - R.I. 12428". The LP comes with a much thicker cardboard sleeve compared to the US release, it has a PARI-MEMBER approved sign on the labels and on the back sleeve underneath the barcode. There is also a "wea Records" logo and some manufacturing information displayed at the bottom of the back sleeve; "MANUFACTURED IN THE PHILIPPINES FOR WEA RECORDS UNDER LICENSE FROM WEA INTERNATIONAL. INC. U.S.A., A WARNER COMMUNICATIONS COMPANY". The record label is grey with black printed text and displays the usual colour "WB Records" logo at the top of each side with the title "SCOUNDREL DAYS A-HA" and full track listing underneath; including track credits and track lengths. The catalogue number 1-25501 is shown on the left and "STEREO" and SIDE 1/2 is on the right. Around the top edge of the label is the regular "Warner Bros. Records Inc." contact address, whilst along the bottom, it shows some manufacturing, distributing and copyright text; "MANUFACTURED IN THE PHILIPPINES BY AUDIO MUSIC CORPORATION. DISTRIBUTED BY WEA RECORDS. UNDER LICENSE FROM WEA INTERNATIONAL. INC. U.S.A. ALL RIGHTS OF THE MANUFACTURER AND OF THE OWNER OF THE RECORDED WORK RESERVED. UNAUTHORISED PUBLIC PERFORMANCE BROADCASTING AND COPYING OF THIS RECORD PROHIBITED". The release doesn't come with any inserts. The Philippine cassette includes a white insert with the regular LP album cover artwork printed in colour at the top of the front sleeve. The full track listing to each side is included in black uppercase lettering underneath. Along the bottom, there is a "PARI MEMBER APPROVED" round symbol, Catalogue number 25501-4 and "WB RECORDS" logo. The layout of the spine and back sleeve is also white with black printed text and is different compared to the UK edition, using a different font style. The title "a-ha SCOUNDREL DAYS" is displayed landscaped in the centre of the spine, with the "WB RECORDS" logo orientated at the top and Catalogue number and "STEREO" again orientated at the bottom. On the back sleeve, the track listing to each side is listed in two columns down the centre, with a large "WB RECORDS" logo on the left and some Manufacturing information printed in a small font along the bottom; "MANUFACTURED IN THE PHILIPPINES FOR WEA RECORDS UNDER LICENSE FROM WEA INTERNATIONAL INC. U.S.A. A WARNER COMMUNICATIONS COMPANY". The inside of the insert displays a large "a-ha" logo in black with the title "SCOUNDREL DAYS" underneath, (it has a similar font layout to the one shown on the spine). The full track listing to each side is also shown which includes track credits and track lengths. Some further Production credits to ATV Music Corp. BMI, Alan Tarney, Mags and Pal Waaktaar is present along with the text; "℗ 1986 Warner Bros. Records Inc. for the U.S." There is also some Copyright information; "ALL RIGHTS OF THE RECORDING COMPANY AND OF THE OWNER OF THE RECORDED WORK RESERVED. UNAUTHORIZED PUBLIC PERFORMANCE, BROADCASTING AND COPYING OF THIS TAPE RECORD PROHIBITED." and a large "WB RECORDS" logo included on the inside of the back cover. The actual tape itself include orange stickered labels, with black printed text. Some copies come with a black cassette, whilst others are instead coloured grey. At the top left hand side of each side, it displays the full track listing landscaped with the regular "WB RECORDS" logo included at the top right. On the left hand side, the "PARI MEMBER APPROVED" symbol is present with Side "1" or "2" and Catalogue number 25501-4 shown on the middle right. Along the bottom of the tape on each side is the title "a-ha SCOUNDREL DAYS" with "STEREO" included at the bottom right hand corner. "Scoundrel Days" was released onto LP in Portugal and comes with the same front cover as the European edition showing the usual album artworks and handwritten title in grey. The back sleeve is white with the regular continuation of the landscape picture along the bottom and colour outdoor picture of a-ha. The green "WB Records" logo is also additionally included. The track listing for side one is displayed in light green and side two in dark green. At the top right hand corner, the regular white barcode is shown with the Portuguese Catalogue number 1590941, circled "(Q)" symbol, "STEREO" logo and "Tambem em Cassete", which refers to being also available on Cassette. There is also a small white rectangular sticker with blue text displaying "WHV". At the lower right of the back sleeve, the usual U.S. Record Company contact address and copyright information is printed in black text and reads; "Warner Bros Records Inc., a Warner Communications Company ® 3300 Warner Blvd, Burbank, Calif. 91510. 75 Rockefeller Plaza, New York, New York 10019. © 1986 Warner Bros. Records Inc. for the U.S. and WEA International Inc. for the world outside of the U.S. ℗ 1986 Warner Bros. Records Inc. for the U.S. and WEA International Inc. for the world outside of the U.S. All Rights Reserved. Unauthorized duplication is a violation of applicable laws". There is also some manufacturing and distributing information included as well near the bottom of the back sleeve showing; "MANUFACTURED & DISTRIBUTED IN PORTUGAL BY EMI VALENTIM DE CARVALHO MUSIC LDA", plus a "G)))" symbol with the text; "execucao Grafica Monumental" which refers to where the LP was Printed. The record itself comes with standard plain white labels and black text. 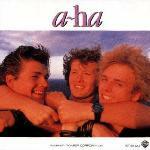 It displays the colour "WB Records" logo at the top, with the "a-ha" logo underneath. The full track listing to each side including the track credits and lengths is displayed at the lower half of the label with the text; "A Warner Communications Company" and logo. On the left hand side, "STEREO" and Catalogue number 1590941 A/B is shown with "S P A" and again the Catalogue number 1590941 on the right hand side. Around the outer rim of the labels (on both sides), is some manufacturing, distributing and copyright information all displayed in Portuguese, it reads; "RESERVADOS TODOS OS DIREITOS DO PRODUCTOR FONOGRAFICO E DO PROPRIETARIO DA OBRA GRAVADA PROIBIDOS A DUPLICACAO O ALUGUER E A UTILIZACAO DESTE DISCO PARA EXECUCAO PUBLICA E RADIODIFUSAO NAO AUTORIZADOS FABRICADO E DISTRIBUIDO EM PORTUGAL POR EMI-VALENTIM DE CARVALHO, MUSICA LDA". The LP also comes additionally with the regular colour inner lyric sleeve, but the Catalogue number displayed on the right hand side has been amended to read 1590941. There is a Russian re-issue of "Scoundrel Days" which was released onto CD after 2002 by "НИКИТИН". It features the same tracks as the slip-case edition and comes in a jewel case, the front and back cover artworks are similar to the Euoropean release, but the handwritten title "a-ha Scoundrel Days" displayed along the top of the front sleeve is slightly larger. There is a silver "WARNER MUSIC INTERNATIONAL FOR SALE IN RUSSIA" hologram sticker displayed in the bottom right hand corner, plus the album also comes with a picture obi-strip. The front of the obi is white and matches the background image of the obi to the same section of the sleeve in which it covers. There is a "WARNER MUSIC" logo in green displayed at the top, with a purple square underneath containing some Russian text printed in white, advertising the hit singles included on the album; "ИЗДАНИЕ ВКЛЮЧАЕТ ХИТЫ: «CRY WOLF», «I'VE BEEN LOSING YOU», «MANHATTAN SKYLINE»", some further Russian text about a-ha and the album release is also shown; "«ВОСЬМИДЕСЯТЫЕ УЖЕ ПРОШЛИ. НО ЗТОТ АЛЬБОМ ЯСНО ИЛЛЮСТРИРУЕТ ТО, ЧТО НЕ ВСЕ В ЭТОМ ВРЕМЕНИ БЫЛО ТАК ПЛОХО» ALL MUSIC ВТОРОЙ АЛЬБОМ НОРВЕЖСКОГО ТРИО. ДИСК ДОБРАЛСЯ ДО ПЕРВОЙ ДЕСЯТКИ ХИТ-ПАРАДОВ МНОГИХ ЕВРОПЕЙСКИХ СТРАН, СТАВ ПЕРВЫМ НА РОДИНЕ МУЗЫКАНТОВ, А В ВЕЛИКОБРИТАНИИ ДОБРАЛСЯ ДО ВТОРОЙ СТРОЧКИ. СУММАРНЫЙ ТИРАЖ ПЛАСТИНКИ ПРЕВЫСИЛ 6 МИЛЛИОНОВКОПИЙ. ", it translates to; "«THE EIGHTIES HAVE ALREADY PASSED, BUT THIS ALBUM CLEARLY ILLUSTRATES THAT, NOT ALL AT THIS TIME WAS SO BAD». ALLMUSIC. THE SECOND ALBUM OF THE NORWEGIAN TRIO. DISC GOT TO THE FIRST TEN HIT PARADES OF MANY EUROPEAN COUNTRIES, RELEASING THEIR FIRST MUSICIANS, AND IN THE UK GETTING UP TO THE SECOND STITCH. THE TOTAL CIRCULATION OF THE PLATE WAS OVER 6 MILLION". At the bottom of the front obi, it contains an image of a Russian flag with the text; "FOR SALE IN RUSSIA", it also displays the "ФИРМА ГРАМЗАПИСИ НИКИТИН" logo. The reverse of the obi again matches the image of the back sleeve in which it covers. At the top, there is some Russian black "Также в продаже:" (Also on sale:) text, plus shots of the available albums "Minor Earth, Major Sky 4607173154231" and "Lifelines 4607173154330" whilst at the bottom, there is white barcode "4607173 157027" and the "www.fgnikitin.ru" website address. The title "A-HA SCOUNDREL" is printed in white, with "DAYS" printed instead in black on the spine. The "ФИРМА ГРАМЗАПИСИ НИКИТИН" logo is included on the left, with the Catalogue number 4607178157027 displayed on the right. On the back sleeve, there is some English Production and Copyright information shown which is similar to that on the earlier slip-case edition; there is however some other additional Russian "НИКИТИН" Record Company contact details, plus "Do not expose to mechanical or magnetic influences. Avoid direct sunlight and moisture" information included; "© & ℗ 1986 Warner Bros. Records Inc. for the U.S. and WEA International Inc. for the world outside the U.S. Произведено в России. Издателы: ООО «Фирма грамзаписи «Никитин» по зксклюзивной лицензии «Warner Music». ВСЕ ПРАВА ЗАЩИЩЕНЫ. Адрес для направления предложений и претензий: «Фирма грамзаписи «Никитин», 105082, г.Москва, ул.М.Почтовая Д. 12, стр. 1,тел. : (495) 232-13-87, e-mail: [email protected], www.fgnikitin.ru Зксклюзивный дистрибьютор: «Торговая фирма «Никитин»: тел. : (495) 265-49-07, 265-49-18; e-mail: [email protected], www.tfnretail.ru Изготовитель (см. информацию на внутреннем кольце компакт-диска вокруг установочного отверстия): ООО «Уральский злектронный завод», 620137, г.Екатеринбург, ул.Студенческая, д.9, корп. 11а. Лицензия ВАФ 77-15 от 21.09.07 г. ООО «Линос» 117587, г.Москва Варшавское шоссе, д.125ж стр 1. Лицензия ВАФ № 77-238 от 03.02.2006г. Музыкальный компакт-диск формата CD-DA. ГОСТ 27667-88, ГОСТ 28376-89, ГОСТ Р 51121-97. Содержит музыкальную запись. Не подлежит обязательной сертификации. Не подвергать механическому или магнитному воздействию. Избегать попадания прямых солнечных лучей и влаги". The back sleeve also includes the "ФИРМА ГРАМЗАПИСИ НИКИТИН" logo and same, but smaller white barcode which appears on the obi-strip. The disc itself is gold and has a similar layout to the European release, displaying the title at the top and full track listing down the left hand side. On the right hand side, the "COMPACT disc DIGITAL AUDIO" logo is shown, along with some English an Russian Production and Copyright text; "℗ 1986 Warner Bros. Records Inc. for the U.S. a Warner Communications Company All Rights Reserved. Unauthorized duplication is a violation of applicable Laws. Издателы: ООО «Фирма грамзаписи «Никитин» по зксклюзивной лицензии «Warner Music». ВСЕ ПРАВА ЗАЩИЩЕНЫ". Along the bottom, it includes the regular text; "PRODUCED BY ALAN TARNEY / *PRODUCED BY MAGS AND PAL WAAKTAAR", plus the "WB", "WARNER MUSIC" and "ФИРМА ГРАМЗАПИСИ НИКИТИН" logos in addition to the Catalogue number 4607173157027. The inside of the album comes with only a two page folded insert and not the usual long fold-out sleeve containing the track lyrics, it includes only the track listing page and the landscaped scene, a couple of the band members pictures taken from the long fold-out sleeve have also been included, although one of them is coloured brownish rather than the usual green. "Scoundrel Days" was re-issued in a card slipcase in 2003, click here for more details. "Scoundrel Days" was re-issued by Никитин in Russia. The sleeve of the cassette is similar to the UK edition and folds out with lyrics. The WB logo and catalogue number are printed in the same orientation as the title, rather than at 90 degrees like on the UK edition. The cassette is a greyish blue colour with black text. It comes in a greyish blue "wea Singapore" plastic case. The LP is similar to the European release showing the regular artworks, but comes without the 'ink blotches' embossed on the front sleeve. The catalogue number WBC 1615 has also been printed at the top right hand corner of the front sleeve. On the reverse of the sleeve, the barcode has been displayed instead at the top left hand corner and comes with a different number "6 001491 000115" compared to the European edition. The Catalogue number WBC 1615 is again located at the top right and also makes reference to being; "Available on Cassette: ZWBC 1615". The regular full track listing for each side is displayed as usual in the centre with side 1 being in light green and side 2 being in dark green. There is a black "WB Records" logo included at the bottom left hand corner next to the usual outdoor picture of the three band members, plus at the lower right hand side under the landscape scene artworks is some Marketing and Copyright text which reads; "Marketed by WEA Records (Pty.) Ltd. A Warner Communications Company a division of Warner Communications Inc. All Rights Reserved – Unauthorised Duplication is a Violation of Applicable Laws". The "Interpok" logo is additionally shown at the very bottom right hand corner. The inside of the LP comes with a stiff paper inner sleeve containing the regular track lyrics and artworks. The Catalogue number and "Interpok" logo is also included. The record itself comes with the standard white labels and black text similar to the UK release, The regular colour "WB Records" logo is displayed at the top with the title "SCOUNDREL DAYS" underneath in black and in a different font. On the left hand side, the Catalogue number reference to both the South African "(WBC 1615 A/B)" and US release "(1-25501)" are shown, plus "EMI Music". On the right hand side, the South African Catalogue number WBC 1615 and "℗ 1986 Wea Intl" are displayed. The full track listing to each side is shown at the lower half of the label including track credits and lengths. The a-ha logo with some Production credits to "Alan Tarney, Mags & Pal Waaktaar" is also shown along with some Record Company text; "A WARNER BROS. RECORDS INC. RECORDING a Warner Communications Company". Around the outer edge of the labels (on both sides), is some additional Manufacturing, distributing and copyright information; "Manufactured and distributed by WEA Records (Pty) Ltd. A licensee of WEA International Inc. ALL RIGHTS OF THE MANUFACTURER AND OF THE OWNER OF THE RECORDED WORK RESERVED. UNAUTHORISED PUBLIC PERFORMANCE BROADCASTING AND COPYING OF THIS RECORD PROHIBITED". The cassette has a black front and back cover with the regular LP album artwork displayed in the centre, along the top there is a white banner which includes both the "wea" and "WB Records" logos printed in black. At the bottom under the album artworks is the title "SCOUNDREL DAYS a-ha" and "DOLBY SYSTEM" printed in white on the black background, "cassette stereo tape" is also shown but again has been displayed in black on a white background. The spine is black with white text and displays the catalogue number at the top ZWBC 1615 and the title at the bottom, there is also a large white barcode included in the centre, it comes with a different number 6 001491 000146. On the back cover, it displays a continuous line of "wea" logos running from left to right, it also contains the full track listing underneath, printed in white and again on a black background. The inside of the insert is white with black text and includes the title and catalogue number at the top with the full track listing underneath, some track credits and "EMI Music" publishing information is also included. On the inside of the back cover, it displays that the cassette was "Marketed by: Tusk Music Company (Pty) Ltd" and shows some copyright information; "All Rights Reserved – Unauthorised Duplication is a Violation of Applicable Laws". Some "Dolby B" text is also included. The "DOLBY SYSTEM" and "Interpak" logos are printed on the inside of the spine along with some "Please spool to end of the tape before playing other side." information. The tape is white with purple printed text; the title is shown at the top along with some copyright information at the bottom. The catalogue number, "STEREO" and "Ⓟ 1986 Wea Intl. "is also included. The cassette release looks rather unofficial, it comes with a white front cover with the titles in red and green at the top and the regular LP album cover artwork in the centre. At the bottom left hand corner it displays a pink "THOMSUN ORIGINAL" logo. The "DOLBY SYSTEM" logo and "STEREO" are additionally shown in black at the bottom right hand corner. The spine and back sleeve is light blue with black text, the "THOMSUN ORIGINAL" logo is displayed landscape on the left hand side of the spine, with the title "a-ha Scoundrel Days" in the centre and catalogue number EN-1149 on the right. The full track listing is shown on the back sleeve along with a bonus track at the end; "This Alone Is Love" taken from the B-side of 12" single "I’ve Been Losing You". The tape is black with a black, white and green stickered label; the track listing is printed at the top in black text, along with Side A/B, catalogue number, "STEREO", "THOMSUN ELECTRONICS" and "DOLBY SYSTEM" logos. Along the bottom, there is a gold "THOMSUN ®" trademark logo with some green "→ LN46" text, plus it additionally shows that it was "MADE IN JAPAN BY MAXELL". The Spanish LP comes with the same front cover as the UK/German edition displaying the regular album artworks and handwritten title in grey, although the ink blotch included is not embossed. On the reverse of the sleeve, the regular barcode number "0 7599-25501-1" is shown in the top right-hand corner with the Catalogue numbers for both the Spanish LP (LY) 925501-1 and Cassette (MY) 925501-4 printed underneath. The full track listing to each side is displayed in the centre of the sleeve with Side One in light green and Side Two in dark green. At the lower right of the back sleeve under the landscaped artwork scene is the usual U.S. Record Company contact and copyright information printed in black; "Warner Bros Records Inc., a Warner Communications Company ® 3300 Warner Blvd, Burbank, Calif. 91510. 75 Rockefeller Plaza, New York, New York 10019. © 1986 Warner Bros. Records Inc. for the U.S. and WEA International Inc. for the world outside of the U.S. ℗ 1986 Warner Bros. Records Inc. for the U.S. and WEA International Inc. for the world outside of the U.S. All Rights Reserved. Unauthorized duplication is a violation of applicable laws". There is also some additional Spanish manufacturing, distributing and printing company information included near the bottom of the back sleeve which reads; "Edita WEA Records S A. Condesa de Venadito, 1 – 28027-Madrid A Warner Communications Company Distribuido por: DISCOS CBS, S.A. Paseo de la Castellana, 93. 20046 Madrid Imprime: INDUGRAF MADRID, S.A. – Alcorcon (Madrid)". The green "WB RECORDS" logo is as usual located in the bottom left-hand corner. The record itself comes with white labels and black printed text. The regular colour "WB RECORDS" logo is displayed at the top with the title "A-ha SCOUNDREL DAYS" included underneath. On the left-hand side, Side A and B are displayed in Spanish to read "Cara A" or "Cara B", "ESTEREO" and "33 1/3 r.p.m." are additionally shown. On the right-hand side of the labels is some Spanish manufacturing text; "Fabricado en Espana por DISCOS CBS, S.A.", Catalogue number 925501-1 and "SGAE". At the lower half of the labels is the full track listing to each side including track credits. There is some other record company production information; "(P) 1986 WEA International Inc." and copyright text; "© 1986 Warner Bros. Records Inc." shown, plus a "Warner Communications Company" logo and legal text; "Deposito Legal: M-32000-1986" (on side A only). Around the outer edge of both labels is some additional Spanish copyright and editing record company information which reads; "Prohibida la reproduccion, la ejecucion publica y la radiodifusion de este disco • Reservados todos los derechos • Impuesto de lujo a metalico • Permiso num 7977 • Editado en Espana por WEA Records, S.A. Madrid Barcelona". The album also includes an inner sleeve which is identical to the UK/German edition, but coming with the revised Catalogue number (LY) 925501-1 and Spanish printing company information; "Imprime: INDUGRAF MADRID, S.A. – Alcorcon (Madrid)". There is a Spanish cassette release of Scoundrel Days which comes with the same front and back cover artworks as the regular release but the colour of the folded insert is more cream coloured rather than white. There is some Spanish Record Company and distributing information printed on the back sleeve which reads; "Edita WEA Records S.A. Condesa de Venadito, 1 – 28027 Madrid. A Warner Communications Company. Distribuido por DISCOS CBS, S.A. Paseo de la Castellana, 93 28046 Madrid. IMPRIME INDUGRAF MADRID S.A. ALCORCON (MADRID)". At the bottom of the spine, there is an additional circled (MY) logo and the catalogue number has been changed to 925501-4. The inside of the insert folds out to include the usual full track lyrics and artwork, but the picture of the band members inside has been printed rather yellowy compared to the regular green colour. There is some additional Spanish text printed on the inside of the back sleeve; "Tambien disponible en LP: 925490-1". Which translates to; "Also available on LP: 925490-1". 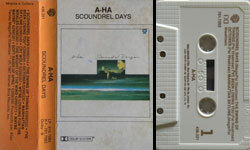 The tape is white with black printed text and displays the title at the top "A-HA - SCOUNDREL DAYS" with the full track listing to each side underneath. On the left of each side, it includes the "WB Records" logo, catalogue number 925501-4 and Record Company Information; "(P) (C) 1986 WEA INTERNATIONAL Inc. A WARNER COMMUNICATIONS COMPANY". Some additional Legal Department text is also included on the left of Side A only; "Dep. Legal: M. 32001-1986". On the right of each side is; "S.G.A.E", "STEREO" and the "Dolby" logo along with side A/B. There is some Spanish Copyright information shown along the bottom of side A which reads; "Quedan reservados todos los derechos del productor fonografico y del propietario de la obra grabada. Salvo autorizacion, quedando prohibidos la duplicacion, alquiler y prestamo, asi como la utilizacion de esta cinta para la ejecucion publica y radiodifusion", whilst along the bottom of side B, there is instead some manufacturing and distributing information again printed mainly in Spanish; "Editado en Espana por WEA Records, S.A. Condesa de Venadito, 1, 28027 Madrid a Warner Communications Company Fabricado en Espana por Discos CBS, S.A.". The back of the cassette case also comes with the "Warner Music Europe" logo engraved into the plastic. There is a Taiwanese LP release of "Scoundrel Days" known to exist which includes a rare transparent green vinyl edition, which includes some picture labels of the three band members on both labels. The printed text is a mixture of black and white to include the regular "WB RECORDS" logo at the top, with the title "A-HA SCOUNDREL DAYS" and some production text; "PRODUCED BY ALAN TARNEY *PRODUCED BY MAGS AND PAL WAAKTAAR" underneath. On the lower half of the label on the left hand side, it includes the full track listing to each side, with the US Catalogue number 25501 and a large "1" or "2" on the right hand side. Along the bottom of each side is an additional Taiwanese Catalogue number WU 1223R. The record sleeve itself is very similar to the US edition containing the regular front and back cover artworks but coming with the Taiwanese "UFO wea Warner/Elektra/Atlantic" logo at the bottom left hand corner of the front sleeve. There is an additional round orange sticker with some black text included at the top of the sleeve, most is shown in Taiwanese but includes the title "A-HA Scoundrel Days", the release date "86" and three tracks; "I’VE BEEN LOSING YOU", "CRY WOLF" and "THE WEIGHT OF THE WIND" available on the album. The "UFO" logo and Catalogue number WU 1223R is included at the bottom. On the reverse of the sleeve, the track listing printed in the usual colours with side one in light green and side two in dark green. The regular long landscaped artwork scene including the picture of the three band members is included at the lower half of the sleeve. Near the bottom of the sleeve on the left hand-side is the "WB RECORDS" logo printed in green. The regular US WB RECORDS contact address details and copyright information is printed in black, but does not include the wording "Made in U.S.A", just leaving an empty space instead. It also includes that the album was "ALSO AVAILABLE ON CASSETTE AND COMPACT DISC". The Taiwan Catalogue number WU 1223R and "UFO wea Warner/Elektra/Atlantic" logo is present, plus some other additional Taiwanese and English Manufacturing information to include that the album was "MADE BY UFO GROUP IN TAIWAN UNDER LICENSE". The green vinyl comes with a 20x20cm 2-sided inner-sheet with the regular album photos and lyrics printed in English (it is similar to the regular inner-sleeve of the UK album, but much smaller). At the top left hand side on both sides of the inner-sheet, it additionally includes the Taiwan "UFO" record company logo and Catalogue number WU 1223R. The European CD Album 7599-25501-2 WE 835 with matrix number (759925501-2.2 07/99) engraved around the centre ring of the disc was imported and used for the Taiwan release, it comes with an additional white Taiwanese obi-strip showing a lilac coloured a-ha logo at the top with a black squiggly line underneath. The English title "Scoundrel Days" is displayed landscaped on the left in light blue, with the Taiwanese translation included alongside in the centre and printed instead in olive green. The a-ha logo is again displayed under the title but this time in Taiwanese and printed in light blue on a pale green background.. Some other Taiwanese text is also included down the right hand side and printed in pale green. Three of the singles; "I’ve Been Losing You", "Cry Wolf" and "Manhattan Skyline" which are included on the album are printed in black and displayed in both English and Taiwanese at the bottom of the front obi. On the obi spine, the "UFO" logo is displayed at the top with the "WB" logo and European catalogue number 7599-25501-2 at the bottom. The Taiwanese showing of the title and a-ha logo are again printed in the same colours as on the obi front. There is some further Taiwanese text on the back of the obi displaying some of the bands earlier albums and hit singles. The cassette comes with a silver folded insert which wraps right round the cassette; it shows the regular LP cover picture artworks on a black background with the title "A-HA SCOUNDREL DAYS" in white, at the bottom left hand corner it includes the "UFO" and "wea Warner/Elektra/Atlantic" logos printed in silver. The remainder of the insert including the spines and back sleeve is silver with black, red and blue Taiwanese text, plus track listing in English. Along the bottom of the back sleeve, it displays that it was "MADE BY UFO GROUP IN TAIWAN UNDER LICENSE" and the back of the cassette case also comes with the "UFO GROUP CO., LTD." logo engraved into the plastic. At the top of each spine, it displays the "UFO" logo along with an additional Taiwan catalogue number WU 1223, the regular catalogue number 25501-4 is shown at the bottom of the spines with the "Dolby" and "WB Records" logos included. One of the spines shows the title in English, whilst the other has it printed in Taiwanese with a different layout and font size. The inside of the insert is white with a black and white shot of the band (Morten, Mags, Pål) plus tracks listed in black. Along the bottom is the usual "Warner Bros. Records Inc., a Warner Communications Company" record company information. The cassette is black with silver/grey titles; it displays the "UFO" logo on the left hand side with the Taiwan catalogue number WU 1223 alongside. On the right, it shows the regular catalogue number 25733-4, along with the "Dolby" and "WB Records" logos. The "MADE BY UFO GROUP IN TAIWAN UNDER LICENSE" manufacturing information is displayed along the bottom in both Taiwan and English. The cassette also comes with a multi-coloured folded lyric sheet displaying the same front and back cover artwork which appears on the inner sleeve of the regular LP release. The Thailand cassette comes with the usual LP artworks displayed at the top half of the front cover, some record company and copyright information is shown at the bottom, it reads; "WARNER BROS. RECORDS INC., A WARNER COMMUNICATIONS COMPANY 3300 WARNER BLVD, BURBANK, CALIF. 91510, 75 ROCKEFELLER PLAZA, NEW PLAZA, NEW YORK, NEW YORK 1001 9 © 1986 WARNER BROS. RECORDS INC., FOR THE U.S. & WEA INTERNATIONAL INC. FOR THE WORLD OUTSIDE OF THE U.S. (p) 1986 WARNER BROS. RECORDS INC. FOR THE U.S. & WEA INTERNATIONAL INC. FOR THE WORLD OUTSIDE OF THE U.S. MADE IN U.S.A. ALL RIGHTS RESERVED. UNAUTHORIZED DUPLICATION IS A VIOLATION OF APPLICABLE LAWS". At the bottom right hand corner, the usual "WB Records" logo and Catalogue number 25501-4 is included. The spine and back sleeve is coloured green with black text, The a-ha logo and title "Scoundrel Days" on the spine has been handwritten and again includes the "WB Records" logo and Catalogue number. The back cover doesn’t include a barcode and displays the full track listing to each side. The same record company and copyright information is additionally shown. The inside of the insert folds out, but is somewhat smaller compared to the regular release, it only includes the track lyrics to four songs; "I’ve Been Losing You", "Cry Wolf", "The Weight Of The Wind" and "Soft Rains Of April". The track credit information included has also been displayed differently. The tape itself is light grey and comes with a white stickered label with black printed text. The title "A-HA/SCOUNDREL DAYS" is displayed at the top with the track listing to each side underneath. The "WB Records" logo and catalogue number 25501-4 is shown on the left hand side, with side 1 or 2 on the right hand side. Along the bottom of both sides, it displays; "PRODUCED BY ALAN TARNEY". Also engraved into the actual plastic of the tape at the top right hand corner of side 1 and on the back of the cassette case itself is the "wea" logo. The Turkish LP of "Scoundrel Days" displays the regular front cover artworks showing the grey handwritten title, but doesn’t include the 'ink blotches' embossed on the front sleeve. The reverse of the sleeve is also similar to the German manufactured release displaying the German only Catalogue numbers for the "LP: 925 501-1 ⨂", "Cassette: 925 501-4" and "CD: 925 501-2". The UK and France numbers are not included. This Turkish LP also doesn’t include a Barcode number in the top right hand corner. Along the bottom of the back sleeve under the landscaped artwork is the regular Company address and copyright information; "Warner Bros Records Inc., a Warner Communications Company 3300 Warner Blvd., Burbank, Calif. 91510. 75 Rockefeller Plaza, New York, New York 10019 © 1986 Warner Bros. Records Inc. for the U.S. & WEA International Inc. for the world outside of the U.S. ℗ 1986 Warner Bros. Records Inc. for the U.S. & WEA International Inc. for the world outside of the U.S. All rights reserved. Unauthorized duplication is a violation of applicable laws". There is also some additional Turkish Record Company and licensing information included; "MMY WEA INTERNATIONAL INC. Lisansı ile MİLLETLERARASI MÜZIK YAYINLARI LTD.Tarafından yayınlanmıştır". The usual green "WB RECORDS" logo and "LC0392" coding is included at the bottom left hand side of the back sleeve. The record label is white with black printed text and displays the usual colour "WB RECORDS" logo at the top of each side with the title "A – HA SCOUNDREL DAYS" underneath. The layout and font size of the text is somewhat different compared to the German manufactured LP. On the left hand side of each side, it shows "stereo" and "GEMA/BIEM", whilst on the right, the Catalogue number 925501-1 and side "1" or "2" are displayed. The lower half of the label contains the full track listing including track numbers and track credits to Pal Waaktaar and Mags. There is also some Production information included; "All songs published by (G.B only) ATV Music Produced by Alan Tarney *Produced by Mags and Pal Waaktaar P+C 1986 Warner Bros Records Inc.". Additionally printed around the bottom edge of the label on both sides is some Turkish Manufacturing and Copyright text which reads; "Plağa alınmış eserlere ait bilumum ya pimcı, imalat ve mülkiyet hakları saklıdır. Bu pl ağın izinsiz olarak alenen çalınması, Radyo'da yayınlanması ve kopyesı yasaktır. WEA INTERNATIONAL INC. Lisans anlaş ması ile MMY tarafından yayınlanmıştır". Some copies of the LP also come with a small red rectangular sticker stuck onto side 2 displaying "KTB PA 6097 P" in blue and golden text. The LP release appears not to include the regular inner lyric sleeve. The Turkish cassette has a similar front cover insert to the UK release but only comes single fold and doesn’t include any track lyrics or artworks inside. There is no barcode on the back sleeve but comes instead with some Production and Copyright information; "(P) 1986 Warner Bros. Records Inc. © 1986 Warner Bros Records Inc. WEA INTERNATIONAL lisansi ile MILLETLERARASI MUZIK YAYINLARI LTD. Tarafindan yayinlanmistir". There is also a Record Company contact address:- "MMY Milletlerarasi Muzik Yayinlari Ltd. I.M.C. 6437 Unkapani-Istanbul". The track listing as usual has been printed down the left and right hand sides of the back sleeve but is shown in bold. At the bottom of the spine, the catalogue number has changed to 925501-4. On the inside of the insert, it displays the title "A-HA SCOUNDREL DAYS" at the top with the full track listing to each side underneath. There is some Production text displayed at the bottom; "All songs ©1986 ATV Music Corp BMI all Rights Reserved Used By Permission. Produced by Alan Tarney. * Produced by Mags and Pal Waaktaar". The inside of the spine displays some Turkish Copyright information which reads; "Kasete alinmis eserlere ait bilimum yapimci, imalat ve mulkiyet haklari saklidir. Izinsiz olarak alenen calinmasi, radyoda yayinlanmasi ve kopyasi yasaktir. ", plus on the inside of the back sleeve, there is some additional "Wind the tape to the end before turning over" text again printed in Turkish; "Kasetin 1. Ve 2. Yuzlerinin muzik sureleri birbirinden farkli olabilir. Kasetinizin arka yuzune gecmeden bandi sonuna kadar sariniz". The tape itself is transparent blue with a light blue and white stickered label. The title "A – HA SCOUNDREL DAYS" is printed in black along the top with the "WB Records" logo included. There is a small yellow rectangular sticker shown at the top right hand corner of side 1 displaying "KTB AAA 59839 K" in gold/green text. On the left hand side it displays side 1/2, "STEREO" and the catalogue number 9 25501-4, whilst on the right hand side there is some Turkish trademark text; "TURK MALI Her hakki Mahfuzdur P & C 1986". Along the bottom of each side, the same Record Company contact address information which appeared on the back sleeve is also additionally shown. There is a Ukrainian cassette of "A-ha Scoundrel Days" which was released by "Никитин" under exclusive license to Warner Music, the front and back cover insert is the same as the Russian "Никитин" edition and comes with the slightly different layout to the artworks compared to the European release. The regular album band member artwork is displayed orientated on the front cover rather than landscaped and includes the additional landscape images. A large grey handwritten a-ha is displayed at the top on a white background with the title "Scoundrel Days" handwritten at the bottom. A silver "КОНТРОЛЬНА МАРКА" hologram sticker is also included on the front cover with the text; "A-ha "Scoundrel Days" A 554068 BM" shown in black. The spine is coloured white with black text, it comes with the title "A-HA / SCOUNDREL DAYS" and "WARNER BROS" displayed landscaped in the centre, the catalogue number 7599-25501-4 HH-186MC/03 is shown orientated at the top with the "WB Records" logo and "WWW.records" website address at the bottom. On the back sleeve which is again white with black text; it includes a black barcode on the left with the full track listing displayed alongside to the right of it. Along the bottom, there is some Production and Copyright information which is printed in both English and Russian which reads; "℗ & © WARNER BROS. RECORDS INC. FOR THE U.S. AND WEA INTERNATIONAL INC. FOR THE WORLD OUTSIDE OF THE U.S. ALL RIGHTS RESERVED. ℗ 2003 ФИРМА ГРАМЗАПИСИ НИКИТИН / WWW.RECORDS BСЕ ПРАВА ЗАЩИЩЕНЫ EMAIL: [email protected] ТЕЛ./Ф. : (095) 781-27-63. ГОСТ 23963-86, ГОСТ 20492-87, ТУ -43-03-30-89. ДИСТРИБЬЮЦИЯ АУДИОКАССЕТ - «ТОРГОВАЯ ФИРМА НИКИТИН»: ТЕЛ: (095) 381-4880, 381-6605. АДРЕС ДЛЯ НАПРАВЛЕНИЯ ПРЕДЛОЖЕНИЙ И ПРЕТЕНЗИЙ: 117545, Г.МОСКВА, УЛ. 1–Й ДОРОЖНЫЙ ПР–Д, Д. 9/10, СТР. 1, ТЕЛ: (095) 381-4880, 381-6605. E-MAIL: [email protected]". The inside of the folded insert is slightly shorter compared to the European release and folds out to show a continuation of the landscape scene from the front cover and includes two other album pictures, the full track listing is displayed in white, but doesn’t include any track lyrics. On the inside of the back cover there is some further Russian text which reads; "Муэыкальнан кассета формата МС. Содержит муэыкальную эапись. Не подлежит обяэательной сертификацииюю. Не подвергать механическому или магнитному воэдействию. Иэбегать попадания прямых солнечных лучей и влаги". When translated into English, it reads; "Music cassette MS format. It contains music recording. Not subject to mandatory certification. Do not expose to mechanical or magnetic influence. Avoid direct sunlight and moisture". The tape is transparent clear with white printed text and differs to the Russian "Никитин" release, it was made instead by "EURO STAR" in the Ukraine. Along the top it displays some Ukrainian text; "Улюблені мелоліі комланія Євростар" with the "European Union" logo included in between, it translates to; "Favourite tunes Company Eurostar". The "EURO STAR" logo is displayed on the left hand side, with Side A/B, "DOLBY HX PRO" and "DIGITAL MASTER" logos on the right hand side. Along the bottom of each side, there is some additional Ukrainian manufacturing information, which includes some telephone and e-mail contact details; "Вироблено в Україні компаніею СП "Кйїв-Євростар" Всі права дотримано Оптовий продаж аудюкасет (044) 456-62-85 455-50-04. 451-45-03 Е-mail ofice @Eurostar kiev ua [email protected] ru.kiev ua". There is no catalogue number included on the tape. The Uruguay LP is very similar to the Argentine release displaying the regular album artworks and handwritten title "Dias de Travesura" in Spanish on the front of the sleeve; it does not however include an additional black "wea" logo in the top right hand corner. On the back sleeve, the track listing is also included in Spanish and again printed in the usual light green for side one and dark green for side two. At the top right hand corner, there is no barcode included, but this has been replaced instead with the Catalogue number 20012-1 which differs compared to other standard European or USA releases. Along the lower right of the back sleeve under the landscaped artworks is some Spanish production text; "PRODUCIDO POR ALAN TARNEY * PRODUCIDO POR MAGS Y PAL WAAKTAAR and "℗ 1986 Warner Bros Records Inc. para los Estados Unidos & WEA International Inc. para el resto del mundo". There is also some Spanish manufacturing information shown in bold; "DISCO ES CULTURA – PRODUCTOR FONOGRAFICO WEL.S.A. Made in Uruguay – Art. 79 Ley 13349 – Imp. Fimasa – D.L. 223.016/87". and Spanish copyright text; "PROHIBIDA LA REPRODUCCION, LOCACION Y PRESTAMO DE ESTE EJEMPLAR Y SU RADIODIFUSION O EJECUCION PUBLICA. RESERVADOS TODOS LOS DERECHOS DE LOS AUTORES DE LAS OBRAS Y DEL PRODUCTOR DE FONOGRAMAS". The regular green "WB RECORDS" logo is included at the bottom left hand side, with the Warner Music Group logo and text; "Una Comparfia del Grupo Warner Communications" printed in black along the bottom centre. The inside of the LP comes with an inner sleeve which is identical to the Argentine release showing the regular album pictures, all of the track titles are again included in Spanish. The Catalogue number on the lyric sheet is 80031. The record itself has white printed labels with black text. The colour "WB RECORDS" logo is displayed along the top of each side, with the same copyright information which appears on the back sleeve included underneath. Above the centre ring is the title "SCOUNDREL DAYS" and "A-HA". On the left hand side, there is some Spanish manufacturing information;" Disco es Cultura AGADU ℗ 1986 Made in Uruguay", whilst on the right hand side, it shows "Art.79" US Catalogue number 1-25501 A/B and "ESTEREO". Below the centre ring of the label is the full track listing to each side printed in English with some track credits to Mags and P. Waaktaar. There is also some other production text; "Produced by Alan Tarney *Produced by Mags & P. Waaktaar" and the Catalogue number 20012-1 A/B displayed along the bottom. The cassette has a white single-fold insert with the regular artwork placed at the top of the front sleeve with a black border. a-ha and the title are printed (again) in blue "Scoundrel Days font" below plus four of the tracks are listed in black; "I’VE BEEN LOSING YOU", "MANHATTAN SKYLINE", "CRY WOLF" and "MAYBE MAYBE". There is a bright pink WB-logo on the front and spine, plus "ESTEREO" and the catalogue number 20012-4 are again in blue. The track listing is shown in black on the back sleeve and on the inside of the folded insert, some track credits and track lengths are also included inside. There is some additional manufacturing and record company information; "FONOGRAMA ES CULTURA. Productor Fonografico WEL S.A. Made in Uruguay – Art.79 – Ley 13.349 – Imp. FIMASA – D.L. 216.605" displayed at the bottom. 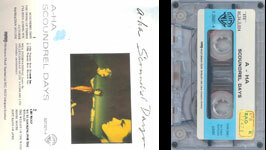 The cassette is white with a gold-ish/charcoal sticker with black text, the title "SCOUNDREL DAYS" is shown at the top of each side with A-HA underneath. On the left hand side, it displays the catalogue number 20012-4, "(P) 1986" and the "WB Records" logo, and on the right hand side it includes side 1 or 2 and "STEREO". Along the bottom of each side there is some Spanish manufacturing and copyright information which reads; "PROHIBIDA LA REPRODUCCION, LOCACION Y PRESTAMO DE ESTE EJEMPLAR Y SU RADIO DIFUSION O EJECUCION PUBLICA, RESERVADOS TODOS LOS DERECHOS DE LOS AUTORES DE LAS OBRAS Y DEL PRODUCTOR DEL FONOGRAMA PRODUCTOR FONOGRAFICO W.E.L.S.A. ART 79 LEY 13346. MADE IN URUGUAY FONOGRAMA IS CULTURA". The USA LP comes with the same front and back cover artworks as the UK/German made releases but doesn't include any catalogue numbers or manufacturing information on the back sleeve. The regular barcode is shown in the top right hand corner with the "Warner Bros. Records Inc." Record Company and Copyright information printed at the bottom, it also includes the text that it was; "Made in U.S.A." and that the album is "ALSO AVAILABLE ON CASSETTE AND COMPACT DISC". The green "WB RECORDS" logo is as usual shown in the bottom left hand corner. The record label itself is white with black text and displays the colour "WB RECORDS" logo at the top of each side, with the title "A-HA SCOUNDREL DAYS" and Production information to Alan Tarney, Mags and Pal Waaktaar on the right hand side. The full track listing along with track credits and track lengths is displayed in column form at the lower half of the label. The regular Copyright and Production text to "Warner Bros. Records Inc." is also included; "ATV Music Corp. BMI (C) 1986 Warner Bros. Records Inc. (P) 1986 Warner Bros. Records Inc. for the U.S.". The inside of the sleeve comes with an inner sleeve displaying the full track lyrics and artworks, there is some slightly different copyright and manufacturing text shown compared to the UK/German release, which is again printed in black down the right hand side; "(C) 1986 Warner Bros Records Inc. for the U.S. Made in U.S.A.". The catalogue number 9 25501-1 is also displayed. Promotional copies of the LP come with gold printed text embossed into the top right hand corner of the front cover which reads; "Lent for Promotional Use Only. Any Sale or Unauthorized Transfer is Prohibited and Void. Subject to Return Upon Demand by Owner. Acceptance of This Record Constitutes Agreement to the Above". The CD edition was released by "Warner Bros" and comes with the regular front and back cover artworks; it was "Manufactured by Discovery Systems" and is similar to the German made release. The same production and copyright information is used on the back sleeve, but it additionally shows that it was "Printed in U.S.A.", unlike the German release, there is no catalogue number displayed in the top right hand corner underneath the barcode, or any German manufacturing information at the bottom. On the spine, part of the Catalogue number 9 25501-2 and title "A-HA SCOUNDREL DAYS" displayed over the artworks has been printed in white instead of black, making it easier to read. The fold-out lyric insert is also included and displays the full landscaped scene on one side in colour, whilst on the other, the track lyrics and the three pictures are shown instead in black and white. The US catalogue number 9 25501-2 has also been printed in the top left hand corner of the lyric track side. The disc itself is silver with black printed text; the layout has changed slightly compared to the German release. The title as usual is displayed at the top with the full track listing now shown down the right hand side. On the left, it displays the regular production and copyright information which reads; "(P) 1986 Warner Bros. Records Inc. for the U.S. a Warner Communications Company ® All Rights Reserved. Unauthorised duplication is a violation of applicable laws". It also includes that it was "Mfg. by DADC". At the lower centre of the disc, the regular production text to Alan Tarney, Mags and Pal Waaktaar is included along with the "WB RECORDS" and "COMPACT disc DIGITAL AUDIO" logos. The catalogue number 9 25501-2 DIDX 898 and "MADE IN USA" is also displayed. Around the centre ring of the disc, it has the text; "Made in USA Digital Audio Disc Corp." engraved into the clear plastic. Some copies of the CD album come in a long box, the cover of which is of similar design to the regular European release, but has obviously be truncated to fit the shape of the box. The "Compact Disc" logo has been printed across the top of the front sleeve with the Warner Brothers logo at the bottom. The regular USA pressed cassette was manufactured at "Warner Bros. Records Inc. 3300 Warner Blvd, Burbank, Calif. 91510 – Made in U.S.A". The front and back cover artworks are similar to the UK release, but the catalogue number on the spine has been changed to 25501-4. There is some additional "Dolby-B" text been included on the inside of the back sleeve. The inside of the folded insert is cream (rather than white) and includes the regular artworks and full track lyrics. The tape is transparent clear with a grey centre piece and white printed text. The title "A-HA / SCOUNDREL DAYS" is shown at the top with the track listing to each side underneath. The "WB" logo and catalogue number 4-25501 is displayed on the left with side 1/2 on the right, some copies also include either an "SR" or "AR" printed underneath side 1/2 on the right hand side. Along the bottom of side 1, it displays the Record Company address; "A Warner Communications Company Ⓡ. Warner Bros. Records Inc. 3300 Warner Blvd, Burbank, Calif 91510 – Made in U.S.A" and along the bottom of side 2, it shows some Production text; "Produced by Alan Tarney *Produced by Mags and Pal Waaktaar © 1986 Warner Bros. Records Inc. ℗ 1986 Warner Bros. Records Inc. for the U.S."
There is a Columbia House manufactured USA cassette release of "Scoundrel days" which comes with a white tape and black titles. The front and back cover artwork is the similar to the regular USA pressing containing the long fold-out sleeve and displaying the full track lyrics, but additionally has printed under the barcode on the back sleeve that it was "Manufactured by Columbia House under license". On the spine, the regular layout to the title "A-HA SCOUNDREL DAYS" is displayed on the left, with the "DOLBY STEREO" symbol and "WB RECORDS" logo included on the right. The Catalogue number is also shown but has been changed to W4-25500. On the inside of the insert, the revised Catalogue number has again been displayed, but some of the regular Warner Bros. Records contact address details "3300 Warner Blvd., Burbank, Calif. 91510" has been omitted, just leaving an empty space. The usual text that the cassette was "Made in U.S.A." has also been included. On the actual tape, the layout and design is vertually the same as the regular USA release, including the same Catalogue number 4-25501 on the left hand side under the WB Records logo. Although additionally displayed along the bottom of side 1 is some slightly different Record Company information which reads; "A Warner Communications Company Warner Bros. Records Inc., a subsidiary & licensee of Warner Bros Inc.". It also states that it was "Manufactured by Columbia House under license" and that it was again "Made in U.S.A.". There is also an Indiana cassette release of Scoundrel Days which was Manufactured in the USA, it is very similar to the actual US Warner Brothers pressing and comes with the same front and back cover artworks, and also includes the folded insert containing all the track lyrics, it additionally has printed over the bottom of the front cover artworks in white text some Manufacturing information "Mfd. for RCA Music Service under License 6550 East 30th Street, Indianapolis, Indiana 46219". The catalogue number C163775 is also displayed in white on the front cover and in black text on the actual spine. The tape itself is white with black text, the layout and design is again very similar to the US pressing, but the Manufacturing information at the bottom of side 1 has been changed, it reads "Warner Bros. Records Inc., a subsidiary & licensee of Warner Bros. Inc. Mfd. for RCA Music Service under License • Made in U.S.A". On the left hand side the Catalogue number C163775 is also displayed. The LP release comes with the regular front and back cover artworks. There is no barcode shown on the back cover and the release doesn't include an inner sleeve. There is some Spanish manufacturing and copyright information displayed at the bottom of the back cover which reads; "Hecho en Venezuela por Roden Discos y distribuido por WEA. "Prohibida la reproduccion, locacion(alquiler) y prestamo de este ejemplar y su radiodifusion o ejecucion publica. Reservados todos los derechos de los autores de las obras y del productor de Fonogramas". Deposito Legal:nb-86-4370. (P) 1986 Warner Bros Records. (C) 1986 Wea de Venezuela". At the bottom left hand corner of the back cover, it includes the "wea" and "WB Records" logos printed in green, with the "P.V.P Bs: 65" and the catalogue number 3152 shown in black. The label on the record is coloured pink and displays a large colour "WB" logo at the top with the title "A-HA SCOUNDREL DAYS" printed in black underneath. The track listing to each side is also included and is displayed both in English and Spanish along with track credits and track lengths. The catalogue number; "WARNER 3152" is displayed on the left and "(P) 1986" on the right. Additionally around the bottom edge of the label on both sides is some manufacturing and copyright text; "HECHO POR WEA VENEZUELA S.A. RESERVADOS TODOS LOS DERECHOS DEL PRODUCTOR FONOGRAFICO DE LAS OBRAS GRABADAS EN ESTE DISCO. PROHIBIDA SU REPRODUCCION, EJECUCION Y UTILIZACION PUBLICA". The cassette release was manufactured by "Rodven" and distributed by "WEA", it comes with a black front and back sleeve with white text similar to the Argentine release, but the regular album artwork picture has been displayed landscaped with the English title "A-HA SCOUNDREL DAYS" at the lower half of the sleeve. The "WB Records" and "wea" logos are also included. On the spine, the title "A-HA SCOUNDREL DAYS" is displayed landscaped at the top again with the "wea" logo and catalogue number 3152 shown orientated at the bottom. There is an additional round white sticker with black text displaying; "RODVEN P.V.P Bs. 70". The back sleeve also shows the full track listing to each side, with side A/B being printed in Spanish to read; "LADO A" and "LADO B". There is also some Spanish maufacturing and distributing information; "Hecho en Venezuela por Rodven Discos y distribudo por Wea de Venezuela". The inside of the insert is white with black text and folds out single-fold to include the full track listing printed in both English and Spanish, along with track credits. There is some Production information; "P 1986 WANER BROS. RECORDS" and Copyright text; "C 1986 WEA DE VENEZUELA" included. The Tape is black with grey printed text. The title "SCOUNDREL DAYS" is displayed along the top with A-HA and the full track listing to each side underneath. On the left hand side, it displays the "WB Records" logo, with side 1/2 and the catalogue number 3152 shown on the right. Along the bottom in the left hand corner it includes some Manufacturing information; "Hecho en Venezuela por Rodven Discos DL-nb-86-4371", with some other Spanish Copyright information shown at the bottom right; "Reservados todos los derechos del productor fonografico y de los autores de los obras registradas en esta cinta. Prohibida su reproduccion ejecucion publica y-O radioteledifusion". The Yugoslavian LP release comes with the regular front and back cover artworks and was pressed by "Jugoton". On the reverse of the sleeve, the barcode is displayed in the top right hand corner with the catalogue numbers for both the Yogoslavian LP: LSWB 73199 and Cassette: CAWB 9244 releases. At the bottom of the sleeve, the usual "Warner Bros. Records Inc." Record Company contact address and copyright information is shown. There is also some Croatian Editorial text printed in bold; "Urednik redakcije: Veljko Despot Glavni i odgovorni urednik: Sinisa Skarica", along with some other manufacturing information; "radna organizacija za nakladu nosilaca zvuka i slike p.o. ZAGREB - Niska b.b. Made in YUGOSLAVIA". The inside of the sleeve comes with the same lyric inner sleeve as the UK edition but the catalogue number has been changed to LSWB 73199. The record labels are cream with black text and displays the colour "WB Records" logo at the top with the title "A-HA SCOUNDREL DAYS" underneath. On the left hand side the "STEREO" and "BIEM" logos are shown with Side 1/2 displayed on the right hand side. On the lower half of the label, the full track listing is shown along with production credits and track lengths. The catalogue number 925 501-1 LSWB 73199 and "A WARNER COMMUNICATIONS COMPANY" is included at the bottom. Around the outer edge of the labels on both sides, is some Croatian manufacturing and copyright information which reads; "SVA PRAVA IZDAVACA I VLASNIKA SNIMLJENOG DJELA SU PRIDRZANA, ZABRANJENO JE NEOVLASTENO UMNOZAVANJE, POSUDIVANJE, IZNAJMLJIVANJE, JAVNO IZVODENJE I EMITIRANJE OVE PLOCE - PO LICENCI PROIZVEO • JUGOTON - ZAGREB. YUGOSLAVIA - SOKOJ • JUS. N. N4 201". The Yugoslavian cassette comes with virtually the same front and back cover insert to the European release, although the regular artworks and printing quality isn’t as clear. At the bottom of the spine it includes a "Jugoton" logo along with the Catalogue number CAWB 9244 printed in black. The size of the back sleeve is also slightly smaller compared to the European release and the text and barcode has been displayed slightly reduced. On the inside of the back sleeve, it folds out to include the usual full track lyrics, but there is some additional Croatian text; "Takoder I na LP ploci LSWB 73199. Urednik redakcije: Veljko Despot Glavni I odgovorni urednik: Sinisa Skarica", it translates to; "also being available on LP and gives credits to the chief Editor: Sinisa Scissors". The "Jugoton" logo has again been displayed on the inside and includes some Croatian manufacturing and distributing information; "radna organizacija za nakladu nosilaca zvuka I slike p.o. ZAGREB – Niska b.b. Made in YUGOSLAVIA". The tape is black with an orange stickered label and black text, it includes A-HA at the top with the title "SCOUNDREL DAYS" and "WEA/JUGOTON" underneath. On the left hand side which is separated by a continuous dashed line, it displays the "Jugoton" logo along with "STEREO" and the Catalogue number CAWB 9244, "BIEM" and "SOKOJ" are also shown. At the bottom left hand corner it displays that the tape was "Made in Yugoslavia". Along the bottom of each side there is some Croatian Copyright information which reads; "Sva prava proizvodaca vrpca I vlasnika snimljenog djela pridrzana. Zabranjuje se presnimavanje, javno izvodenje I radiodifuzija ove vrpce". There is a Zimbabwean LP release of Scoundrel Days which comes with the same front cover sleeve as the South African edition displaying the regular artworks, but again doesn’t include the embossed ‘ink blotches’. The same Catalogue number WBC 1615 is used, and has additionally been printed in the top right hand corner. On the reverse of the sleeve, the same barcode number "6 001491 000115" as the South African LP is also included in the top left hand corner, along with the Catalogue number WBC 1615 and the fact that the LP was "Available on Cassette: ZWBC 1615" shown at the top right. At the lower half of the back sleeve, under the landscape artworks, there is some different Marketing and Copyright Information compared to the South African edition, it reads; "MARKETED BY GRAMMA RECORDS All Rights Reserved – Unauthorised Duplication is a Violation of Applicable Laws". The regular black "WB RECORDS" logo is also displayed at the bottom left, with the "bardwell" logo included at the bottom right. The record itself comes with black and white labels rather than colour, and the layout is slightly different compared to the South African release. The "WB Records" logo has as usual been displayed above the centre ring but is shown slightly smaller, plus the Copyright information printed around the outer top edge is worded slightly differently and displayed in lower case lettering; "All rights of the Record Producer and of the owner of the work reproduced reserved. Copying, Public Performance and Broadcasting of this record prohibited". The record also shows above the "WB" logo (in bold) that it was "Manufactured by TEAL Record Company". On the left hand side of each side, the running speed of 33⅓ RPM, US Catalogue number 1-25501, Record Company text; "1–5 EMI Music" and SIDE 1 or 2 are shown, whilst on the right hand side, the Catalogue Number WBC 1615 and Production text; "(P) 1986 WEA Intl." is displayed. The title SCOUNDREL DAYS A-Ha has been printed at the lower half of the centre ring with the full track listing to each side underneath, the track lengths and track credits are included. The usual Production text to "Alan Tarney", "Mags" and "Pal Waaktaar" is also shown. The release unlike the South African pressing doesn’t appear to include an inner lyric sheet.